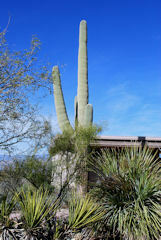 One more day of freedom and then it's back to the brown and grey of a Tennessee winter. 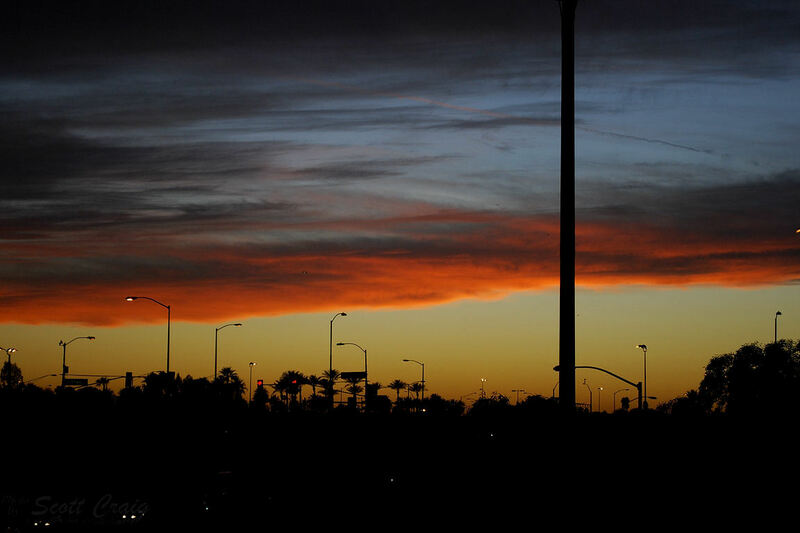 It's funny that regardless of where I am it's the same sun rising there as it is in Tennessee, but it always looks different. 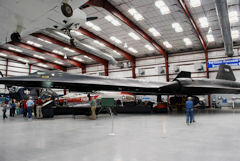 Today being my last full day before I head back to Tennessee it is scheduled to be a full one. 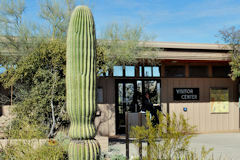 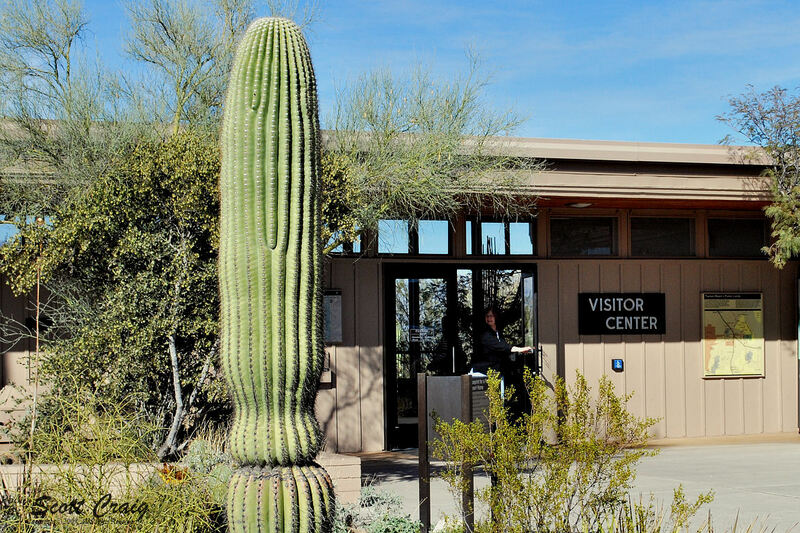 We are headed south to the Casa Grande Ruins National Monument so I can collect an Arizona stamp for my Passport Stamp collection and then further south to Tucson, AZ and the Pima Air and Space Museum. 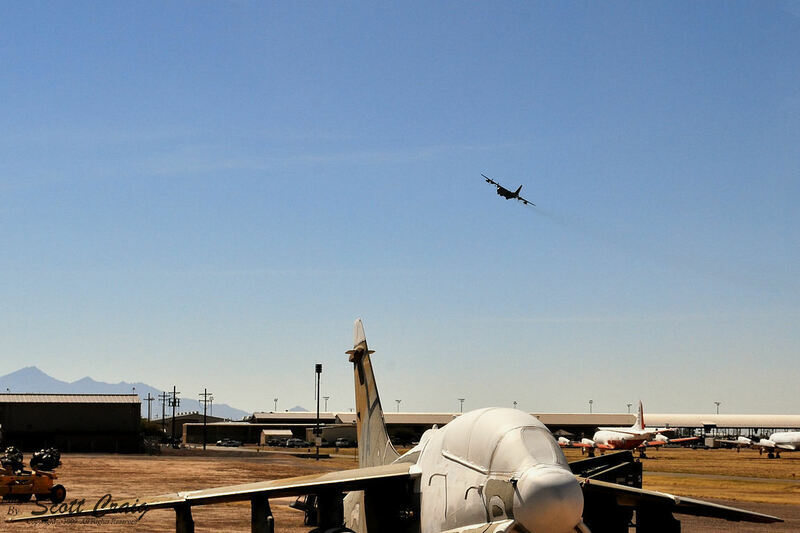 Anyone who knows me knows that a vacation would not be a vacation without something to do with airplanes involved. 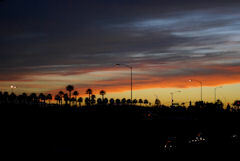 We headed out early, early by AGirl's standards since I had already been up for an hour, to miss the early morning Phoenix traffic and headed south on I-10. 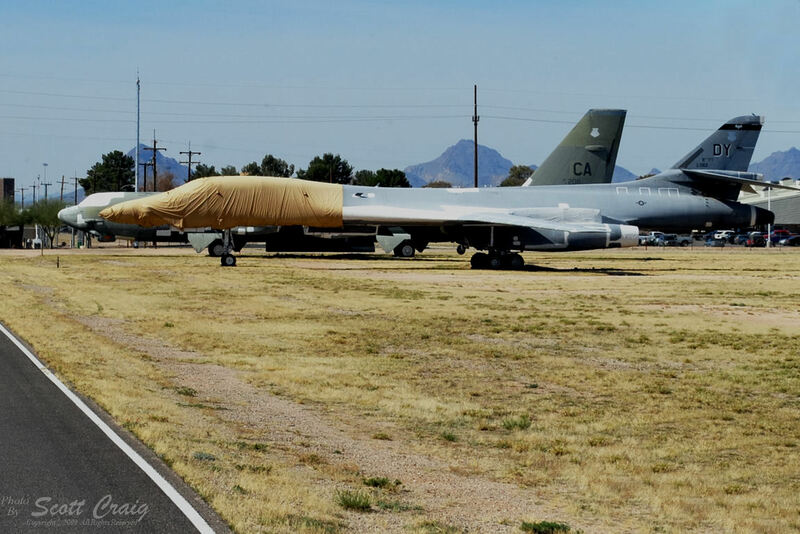 A little on the chilly side again, and my heated jacket liner once again did a great job of keeping the cool out. As was expected though, it didn't last and I started shedding layers pretty quickly. 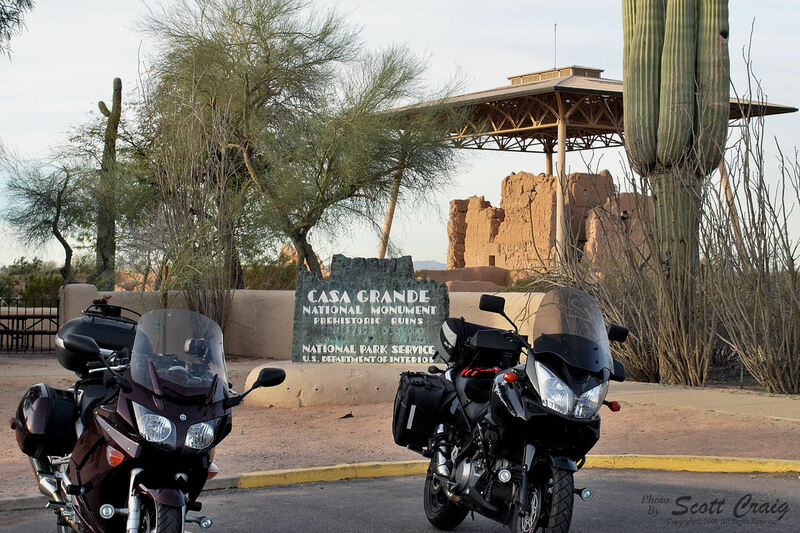 An easy 56 mile run down the interstate and a couple of state highways brought us to the Casa Grande Ruins National Monument near Coolidge, AZ. 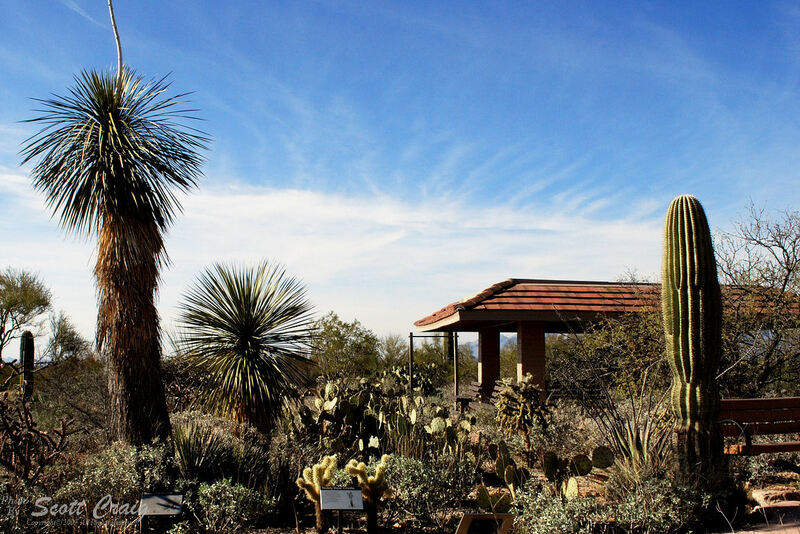 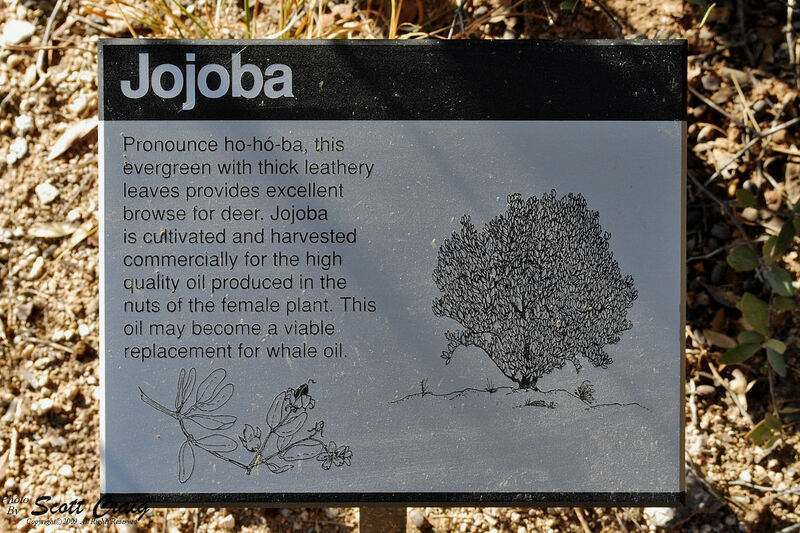 These ruins are, "... an ancient Hohokam farming community and "Great House." 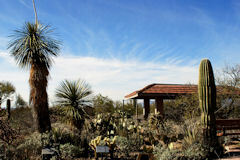 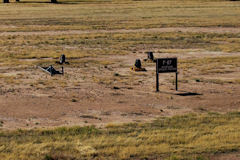 Created as the nation’s first archeological reserve in 1892, the site was declared a National Monument in 1918. 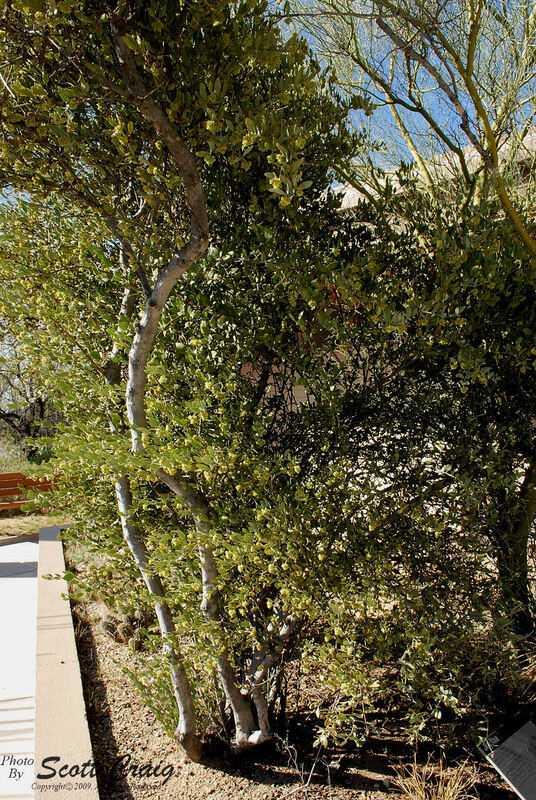 We didn't stick around very long because we've got a full day ahead. 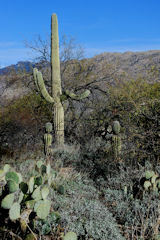 We just grabbed our stamps, a couple of "I Was There" photos and headed south toward I-10 again. 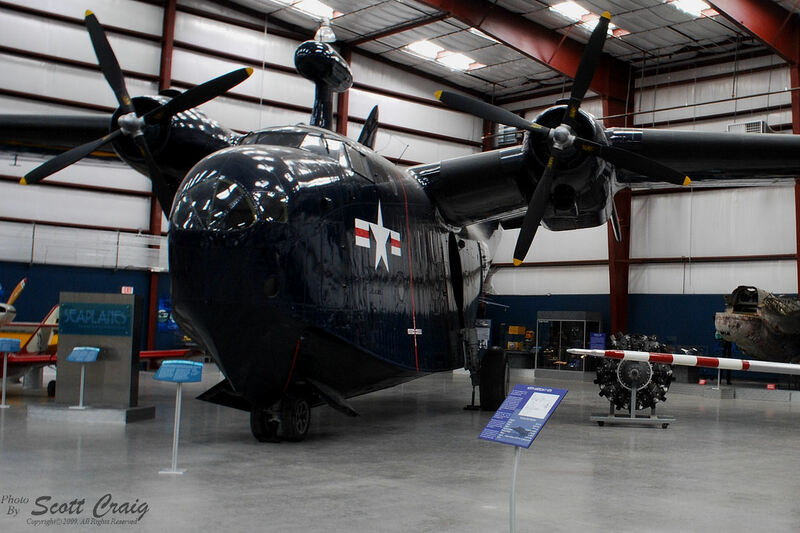 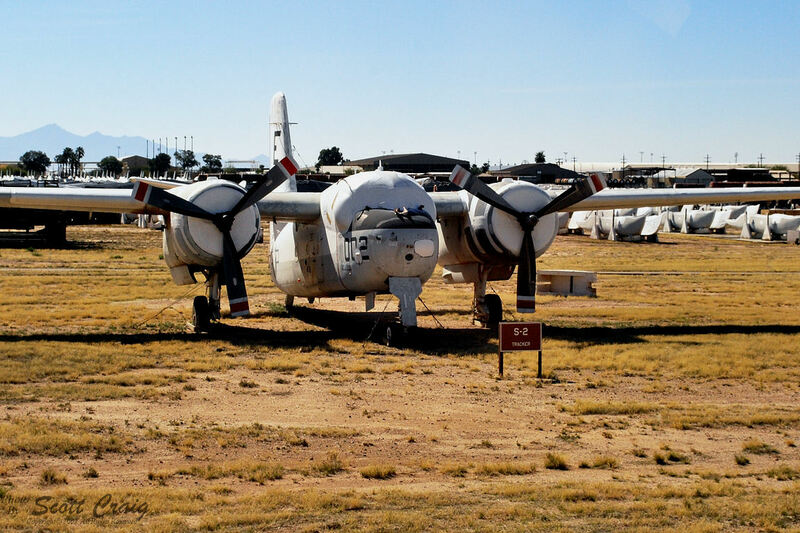 Another 78 mile run brought us to the Pima Air and Space Museum and the home of the 309th Aerospace Maintenance and Regeneration Group at Davis-Monthan Air Force Base at Tucson, AZ. 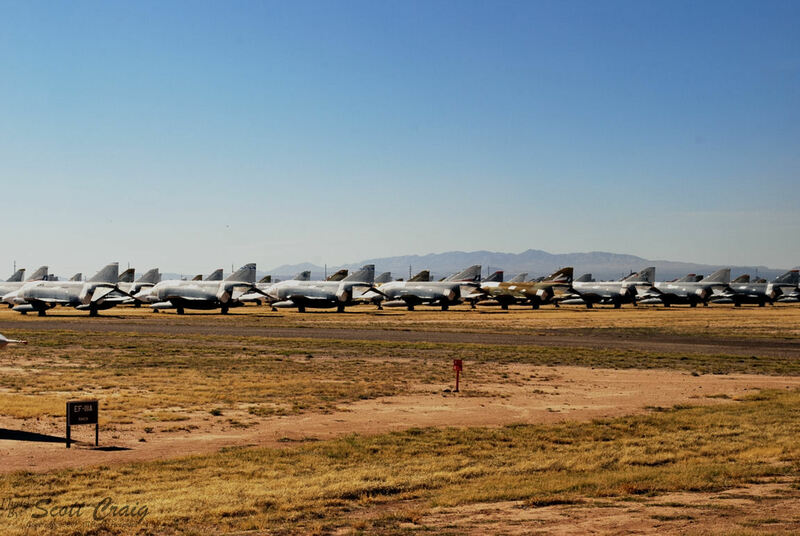 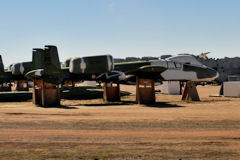 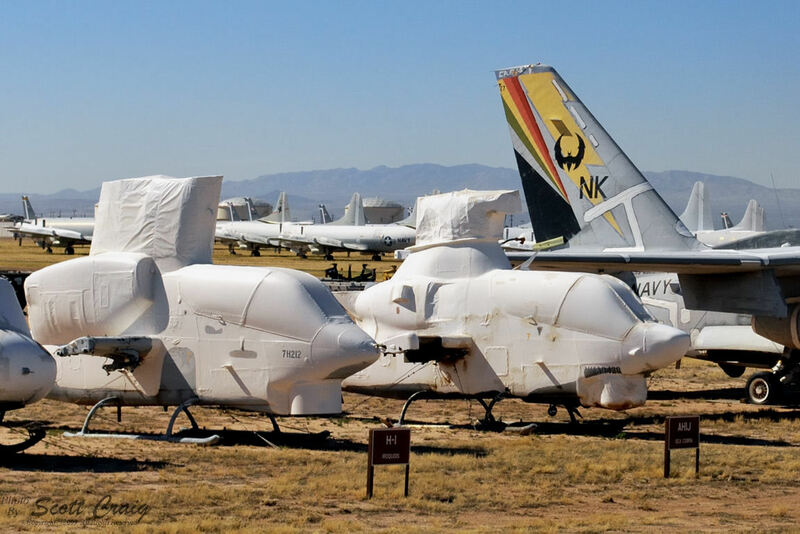 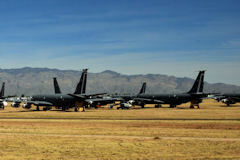 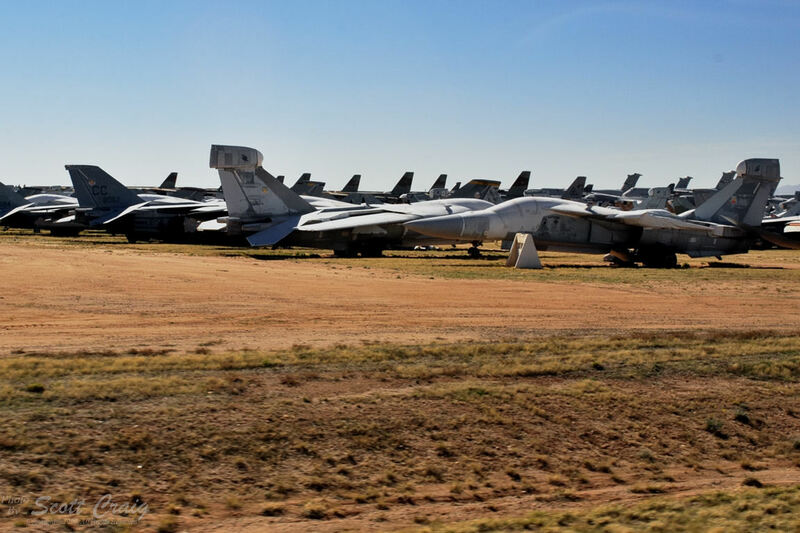 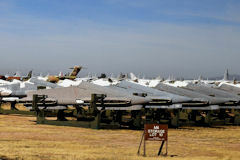 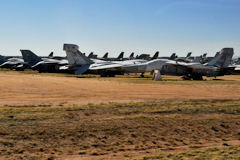 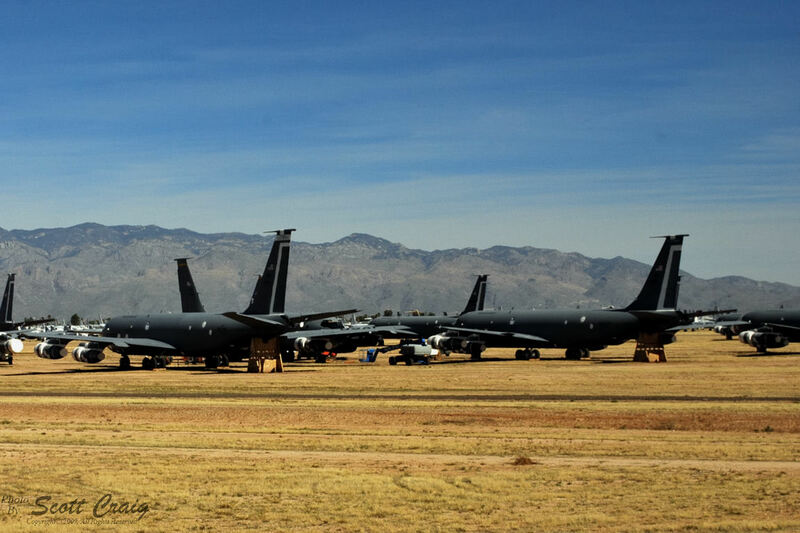 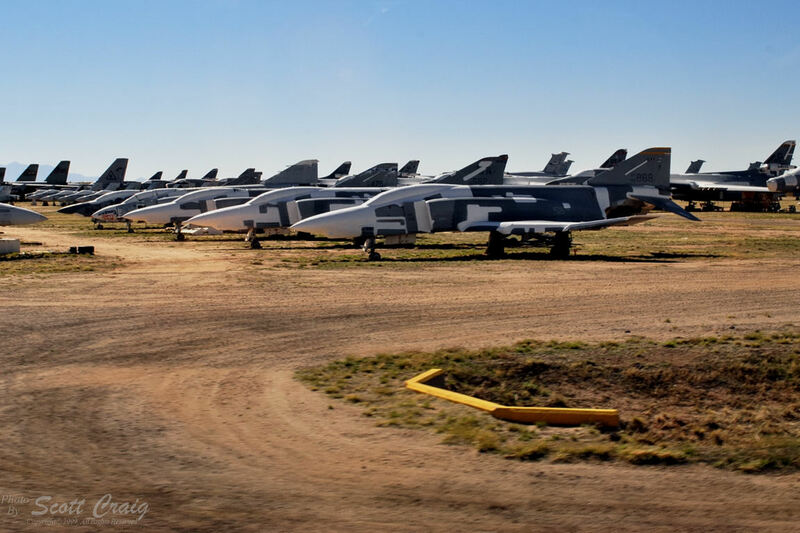 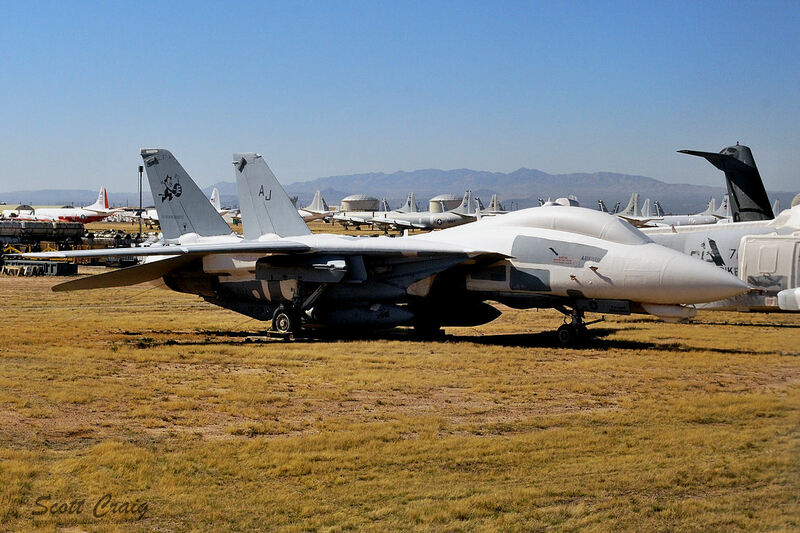 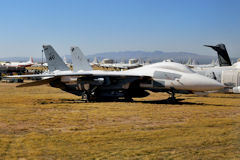 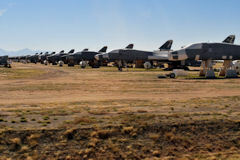 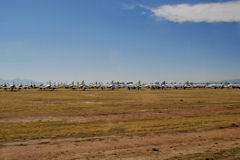 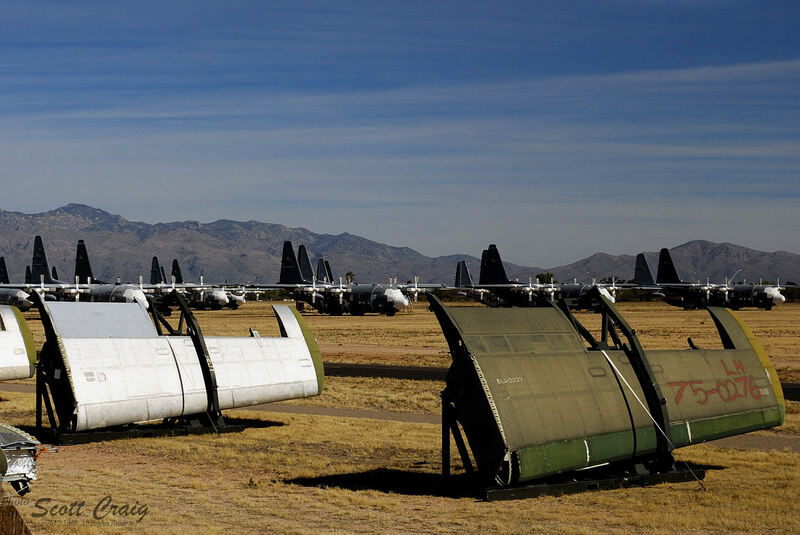 I've wanted to visit the "Boneyard", as the AMARG facility is known, for years because it is where old airplanes go to die, or, in some cases, be born again. 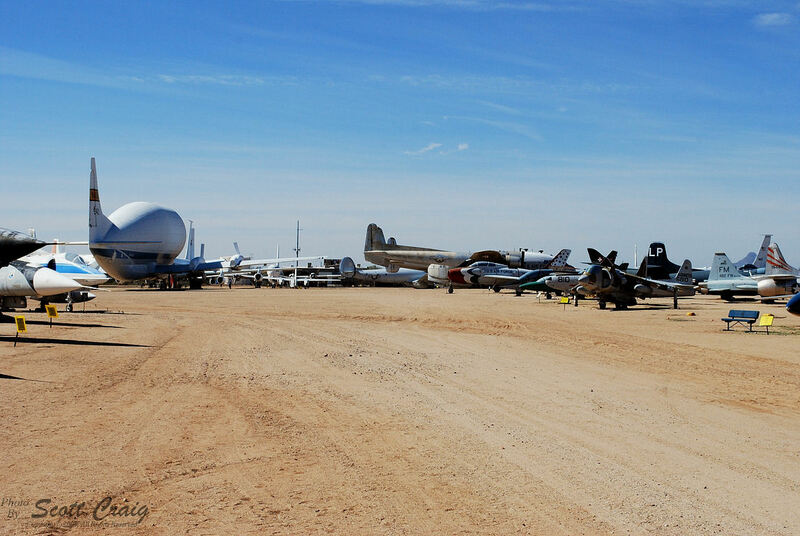 In some ways it is a depressing facility since there are so many airplanes there that will never fly again, but on the other hand it is stimulating because it provides a viable source of parts for older aircraft to keep them flying. 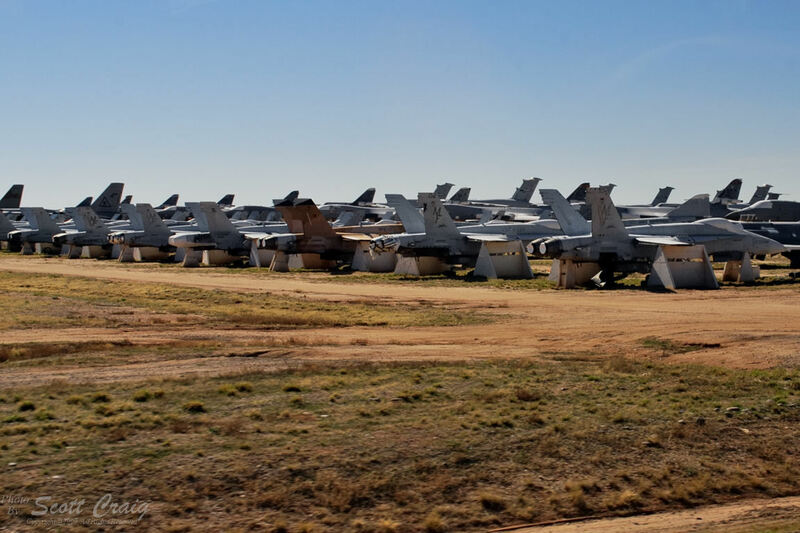 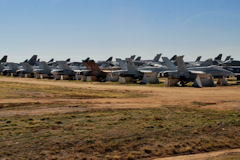 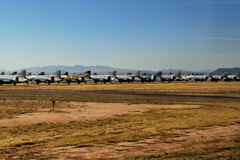 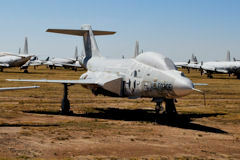 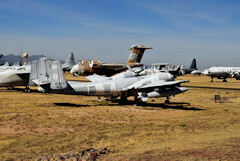 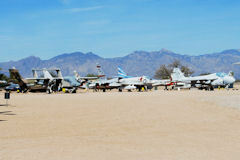 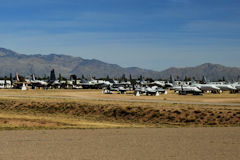 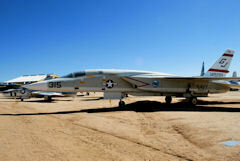 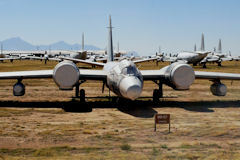 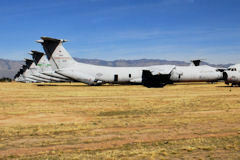 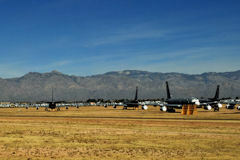 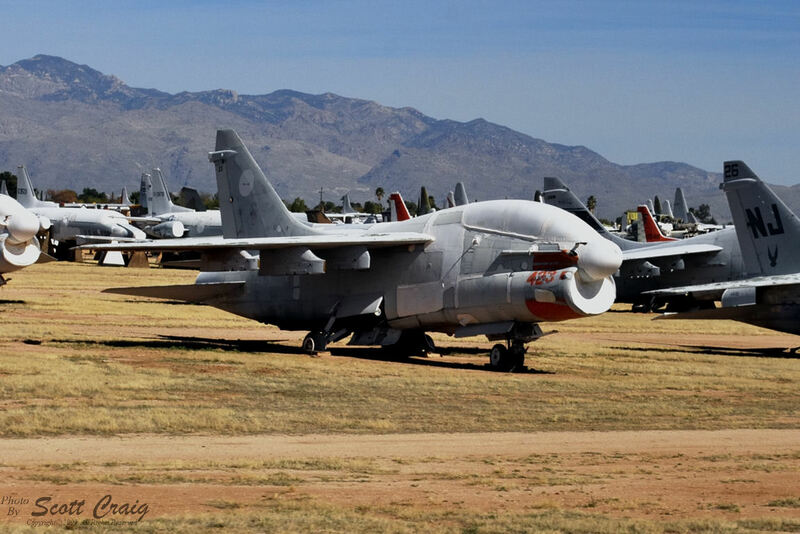 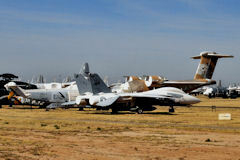 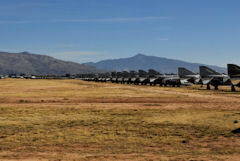 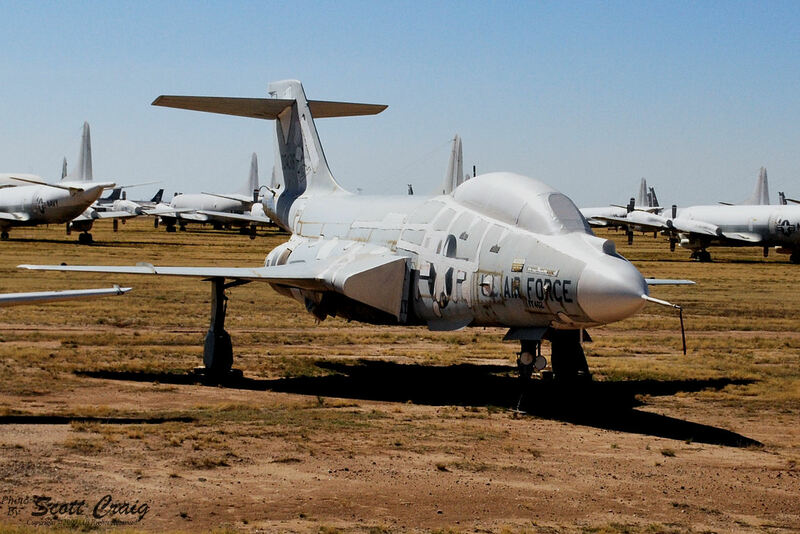 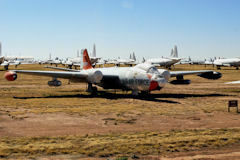 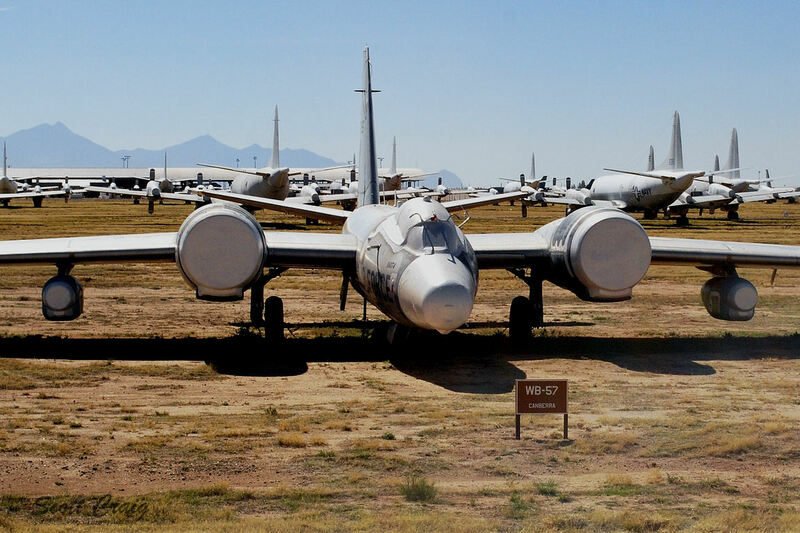 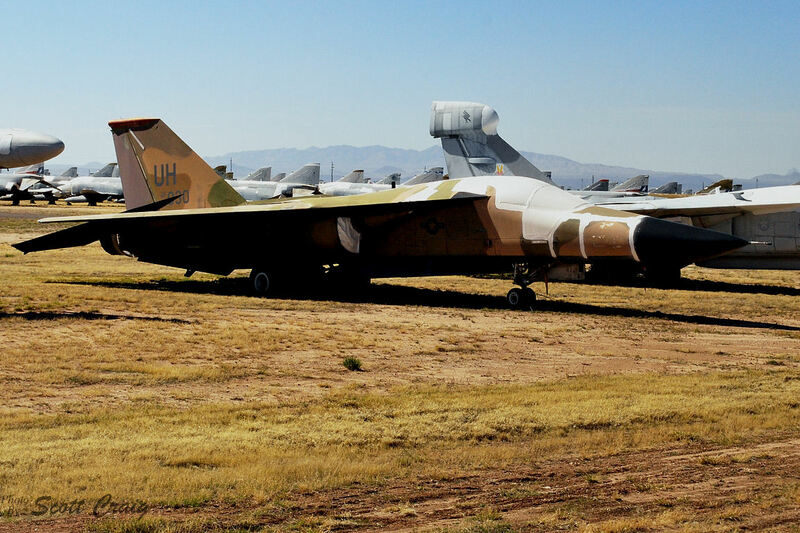 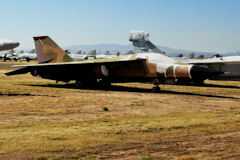 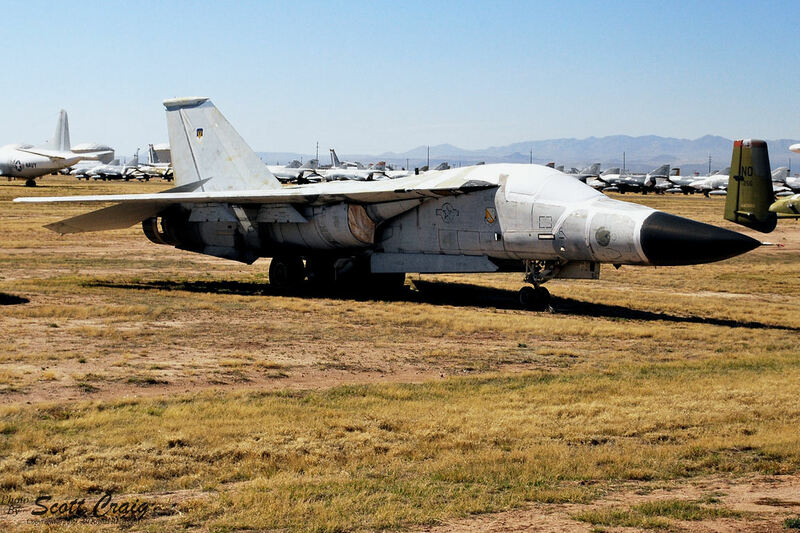 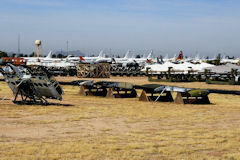 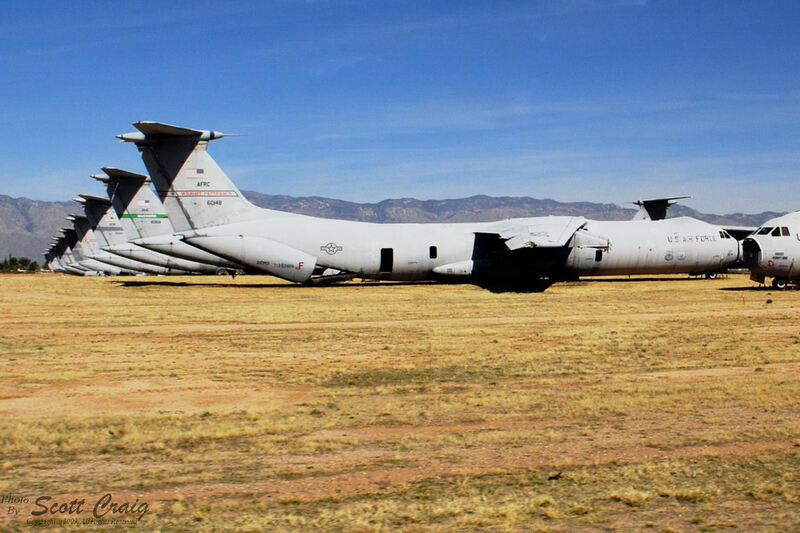 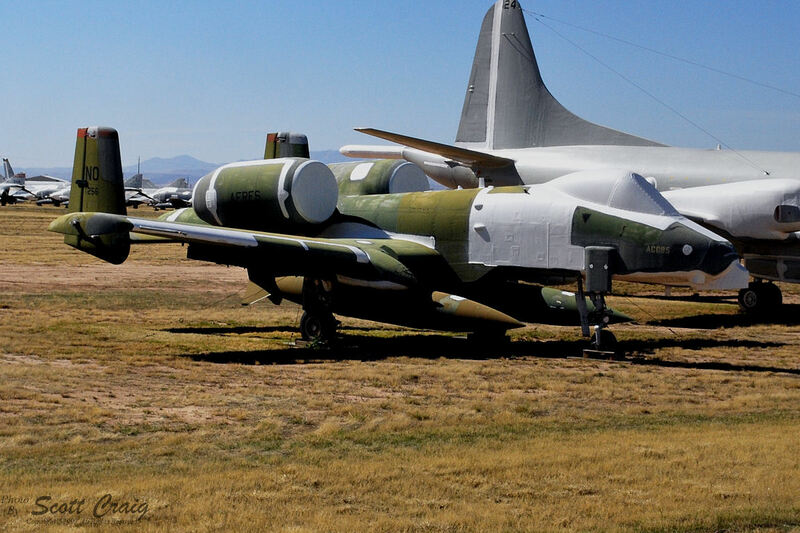 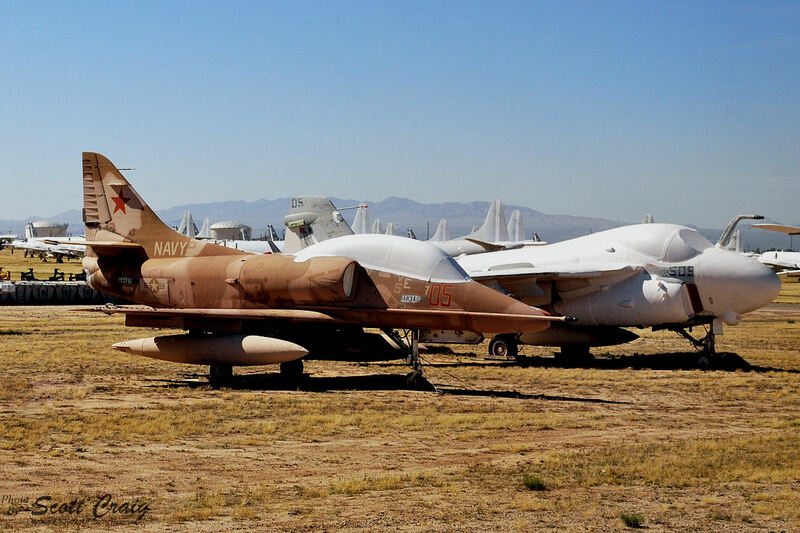 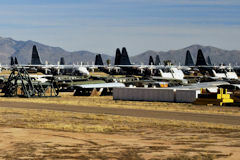 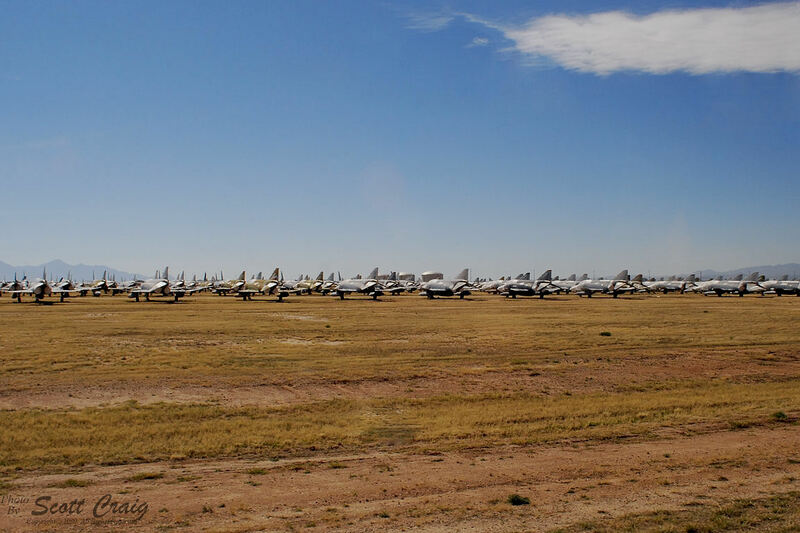 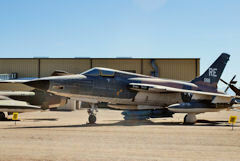 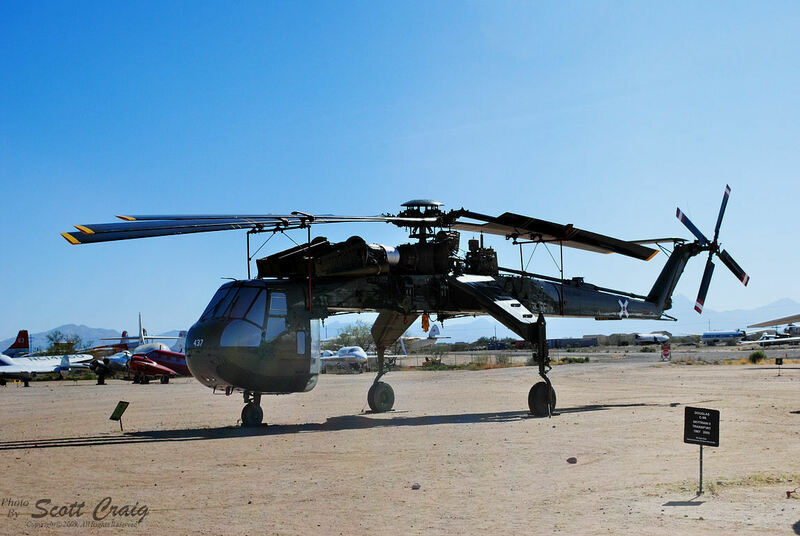 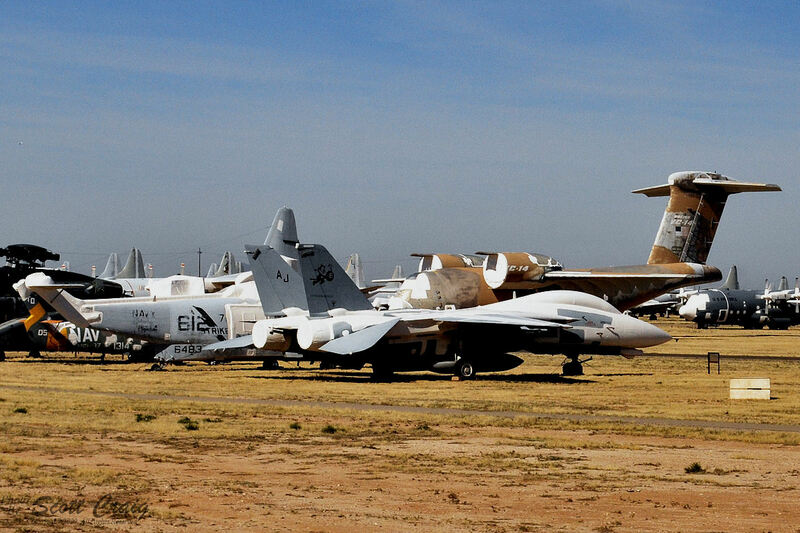 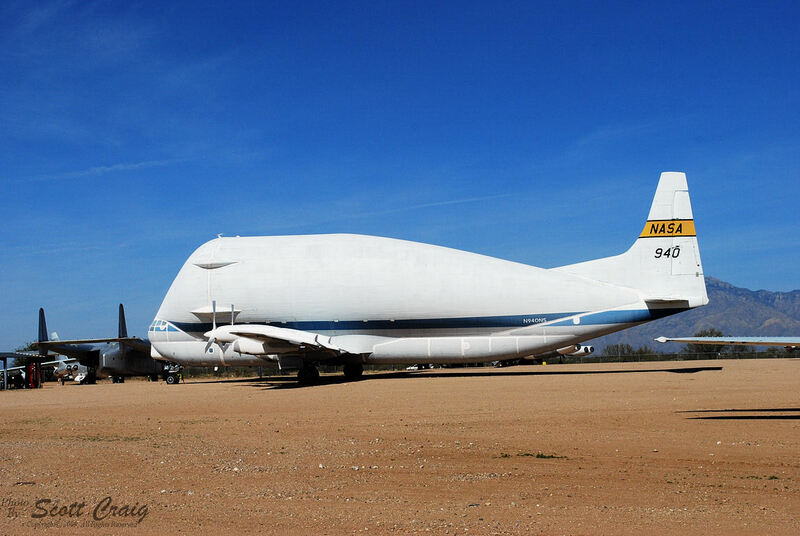 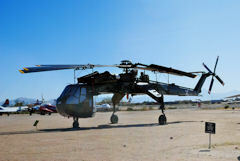 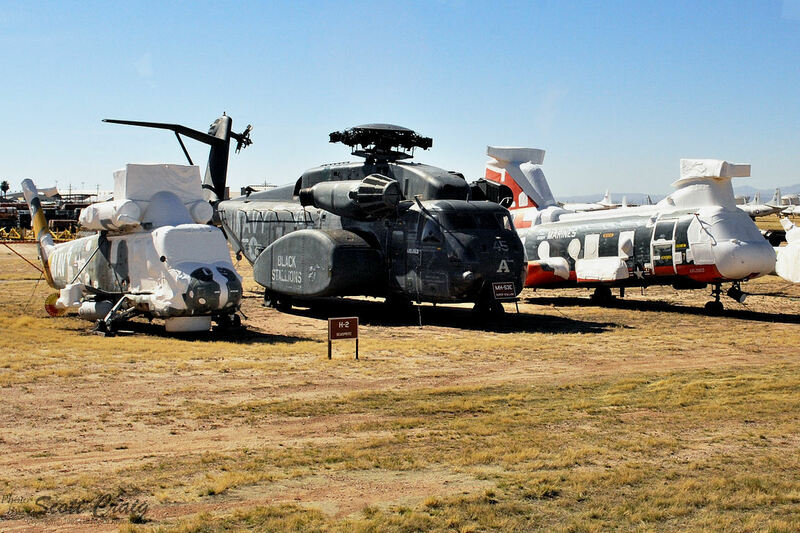 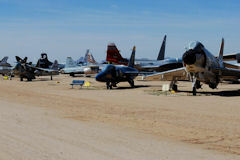 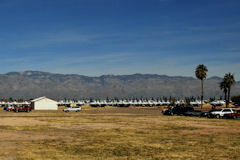 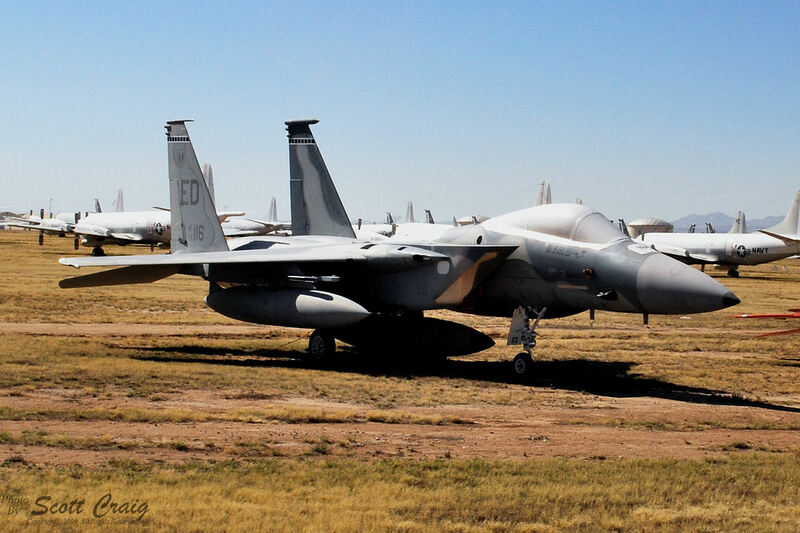 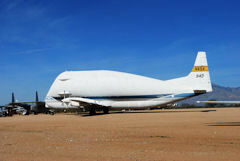 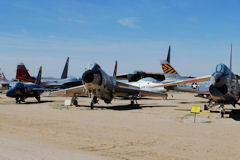 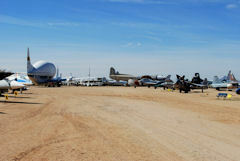 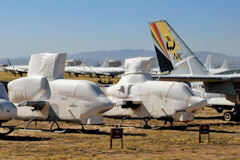 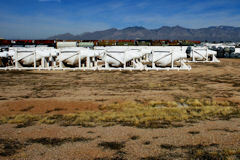 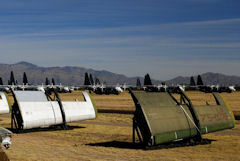 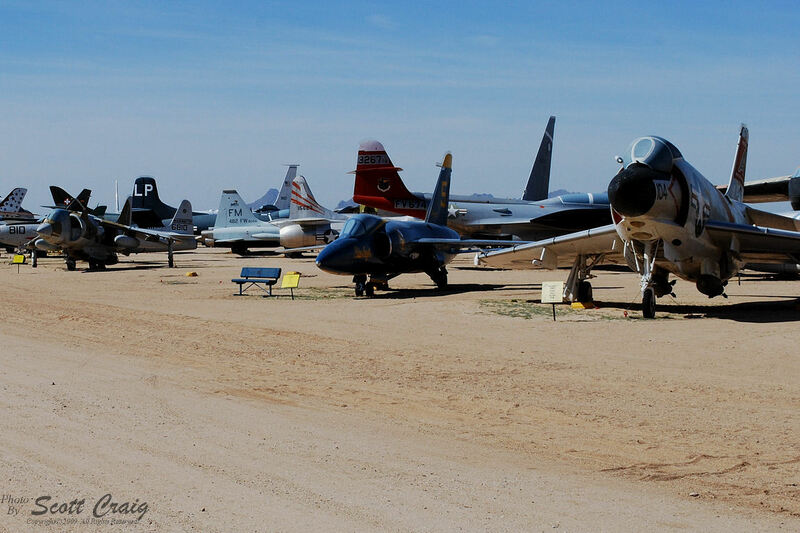 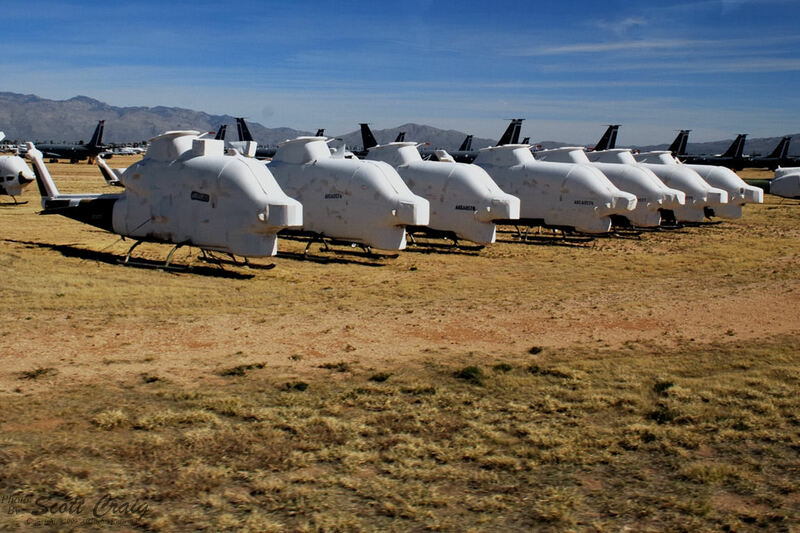 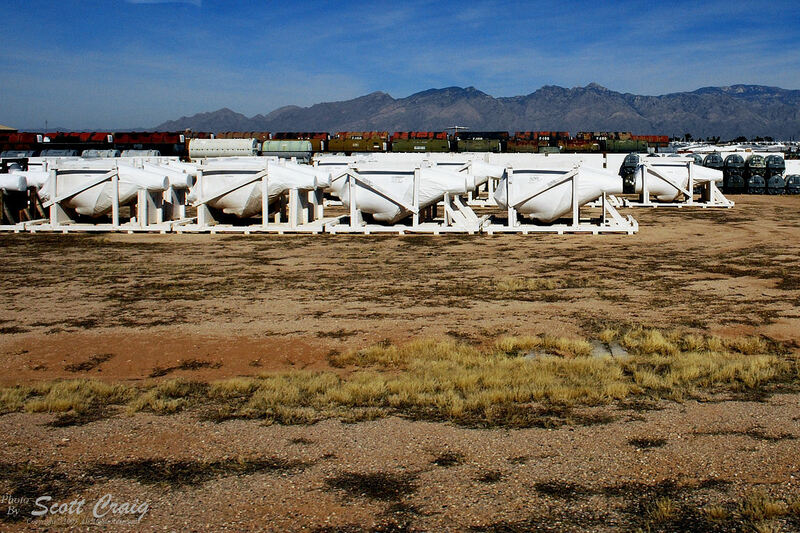 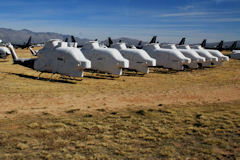 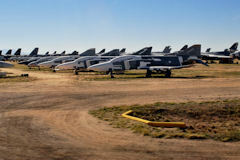 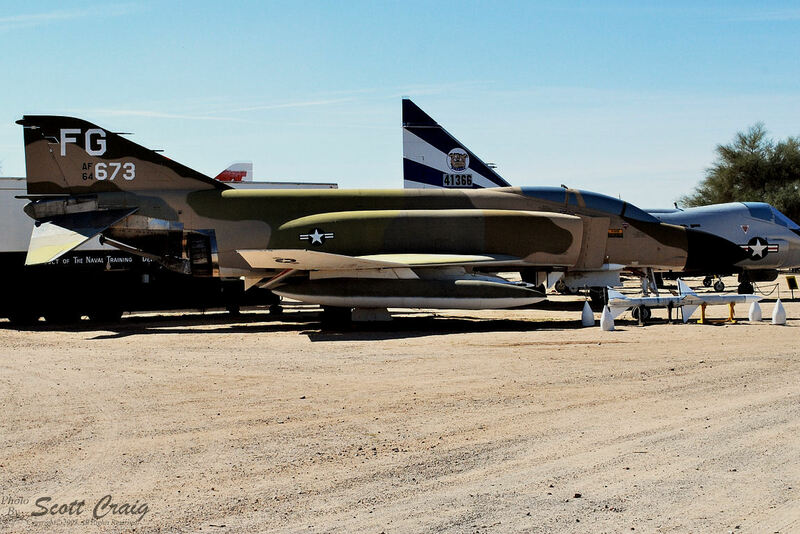 At any time there are over 4,000 aircraft sitting in the desert in preservation or being dismantled for parts. 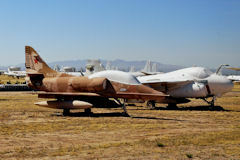 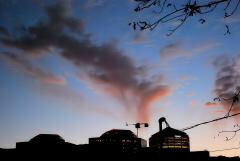 Once there is no longer a need for the parts of a particular type the remainder are destroyed and sold for scrap. 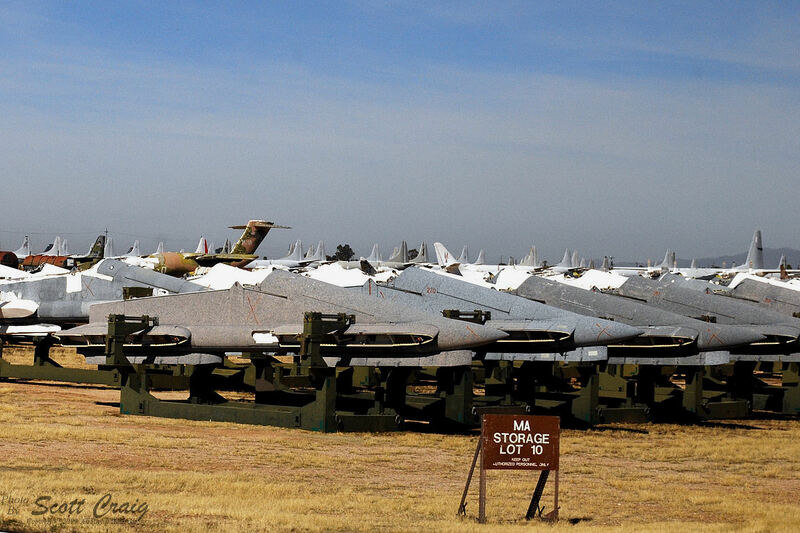 To a pilot that is painful to accept because we hate to see any aircraft destroyed. Visitors are not allowed to just walk through the AMARG facility since it is on an active US Air Force Base so we took the bus tour. 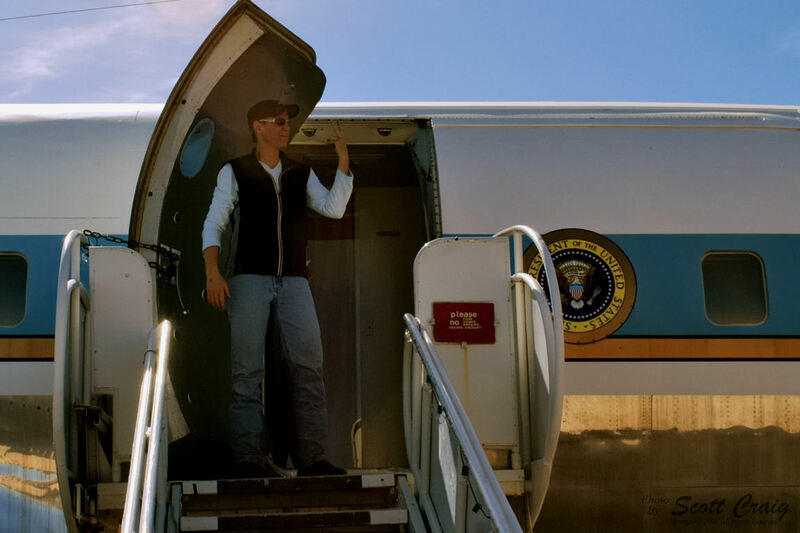 The bus stopped at various places, especially down "Celebrity Row", but in other places it just kept rolling. 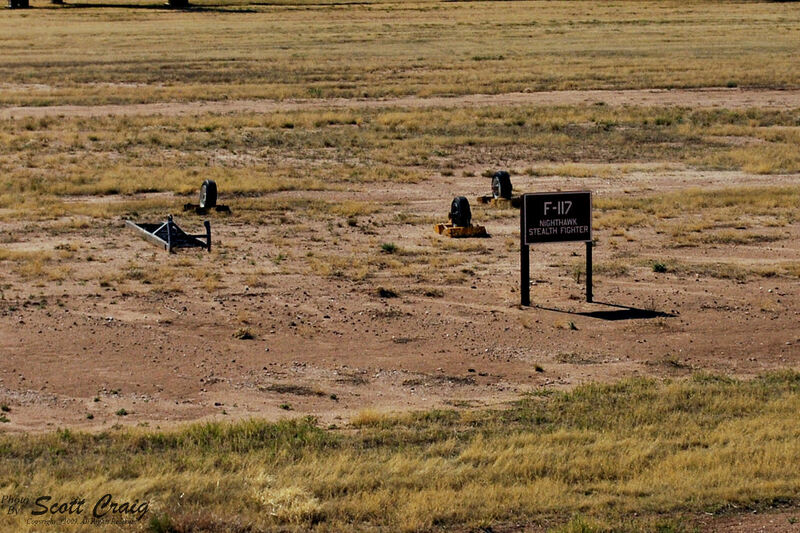 I had to shoot photos through the glass of the window of a bouncing bus so don't be too surprised at the reflections that show up in some of the photos. 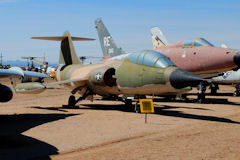 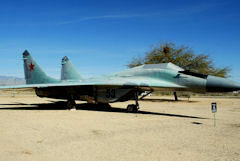 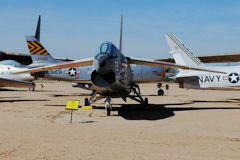 After the "Boneyard" tour we returned to the Pima Air and Space Museum where we were free to walk around and look at the exhibits. 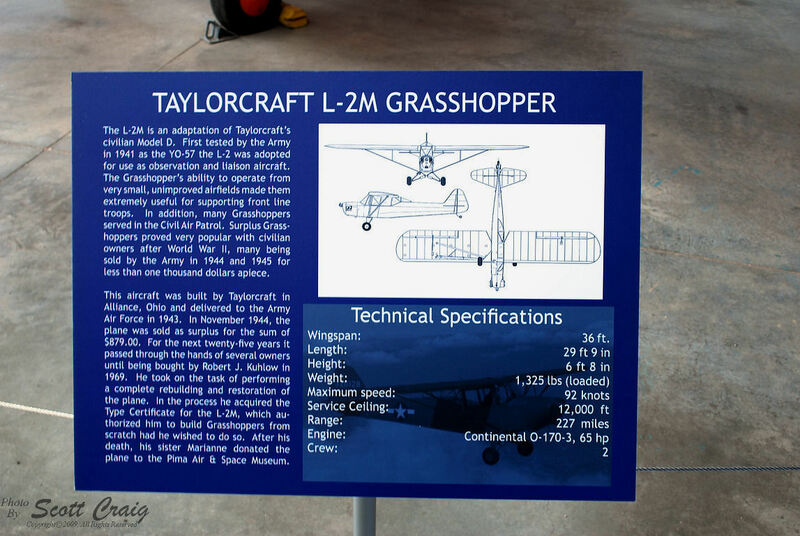 There are both indoor and outdoor exhibits, and I was surprised, and impressed, to note the level of care and maintenance that the outside exhibits were given. 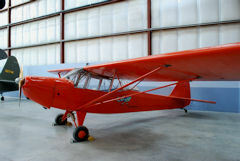 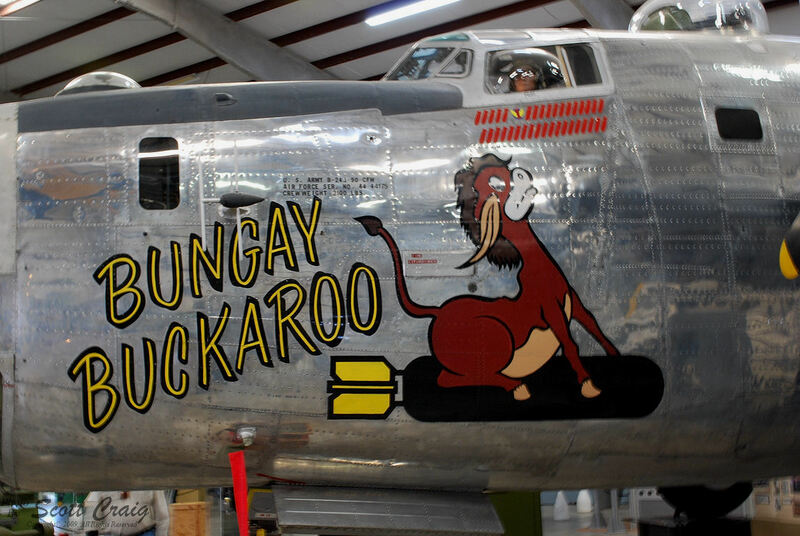 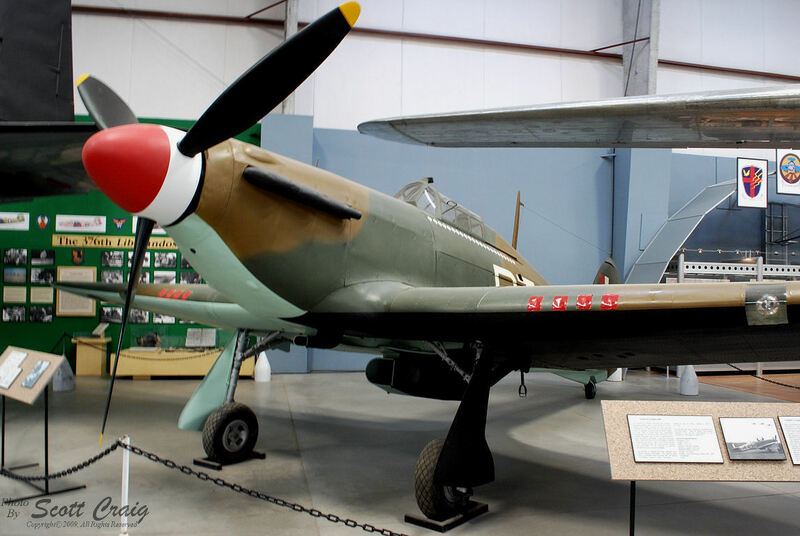 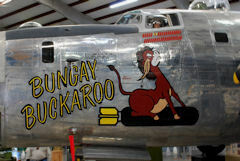 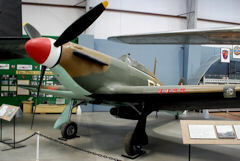 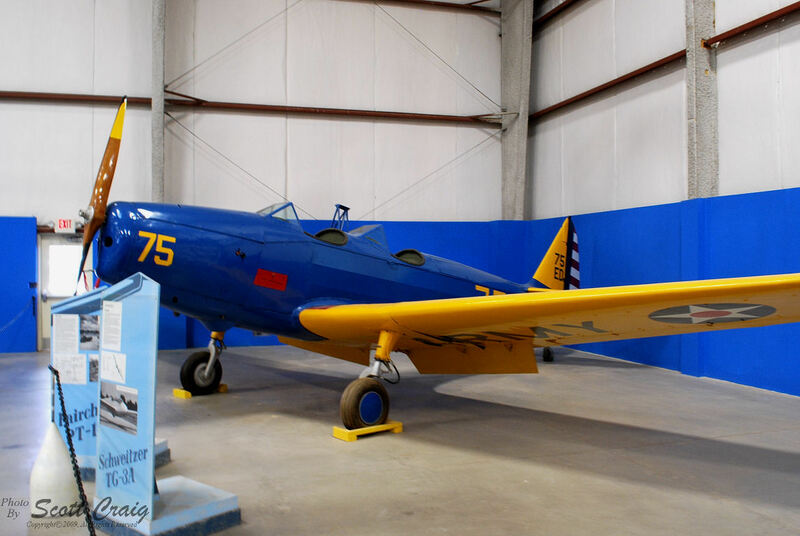 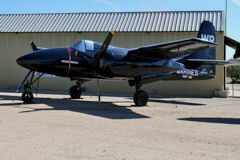 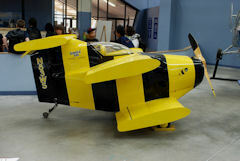 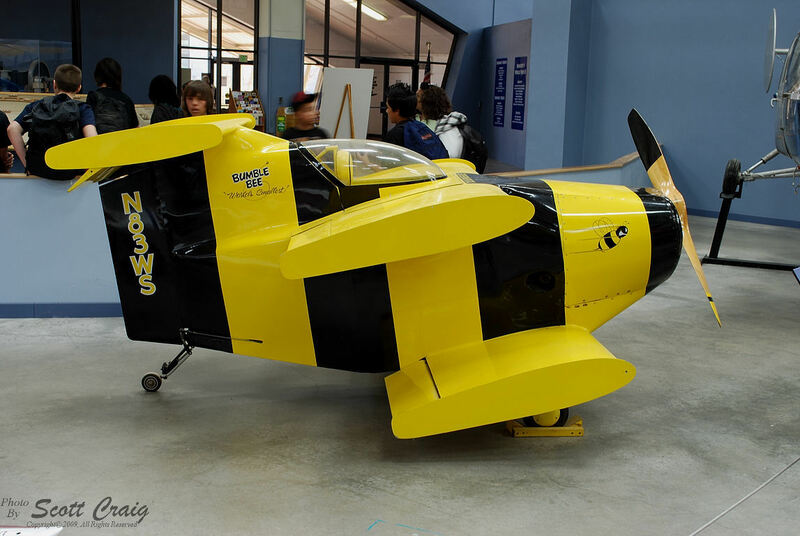 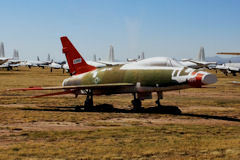 These aircraft were not covered in "Spraylat" like those in the Boneyard across the highway but rather were painted in their squadron colors. 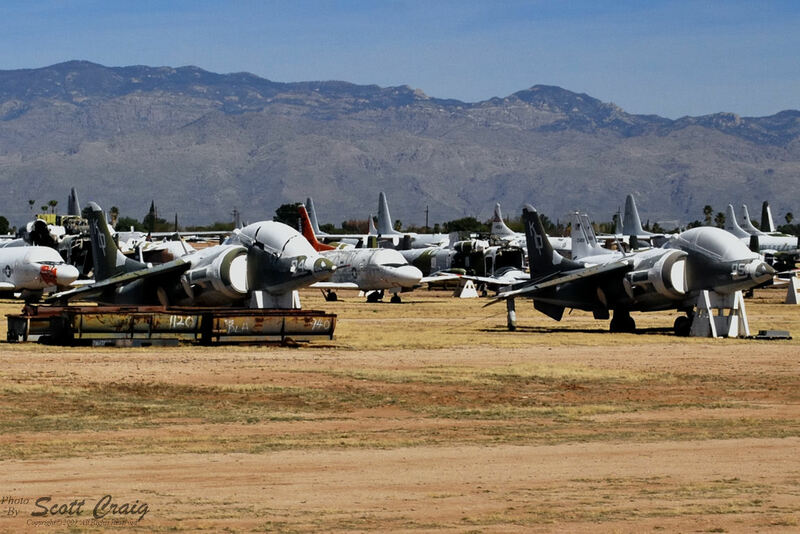 Given the blistering Tucson summer sun it impressed me that that they kept the aircraft in such a well-maintained condition. 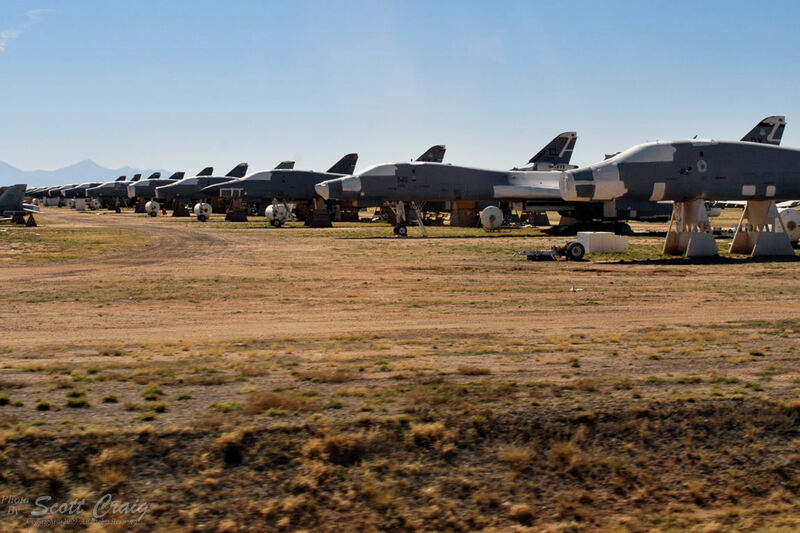 I guess having an aircraft maintenance group live across the highway helps a great deal but even so it is a lot of work to keep that many aircraft as well maintained as they do. 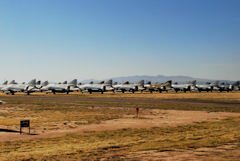 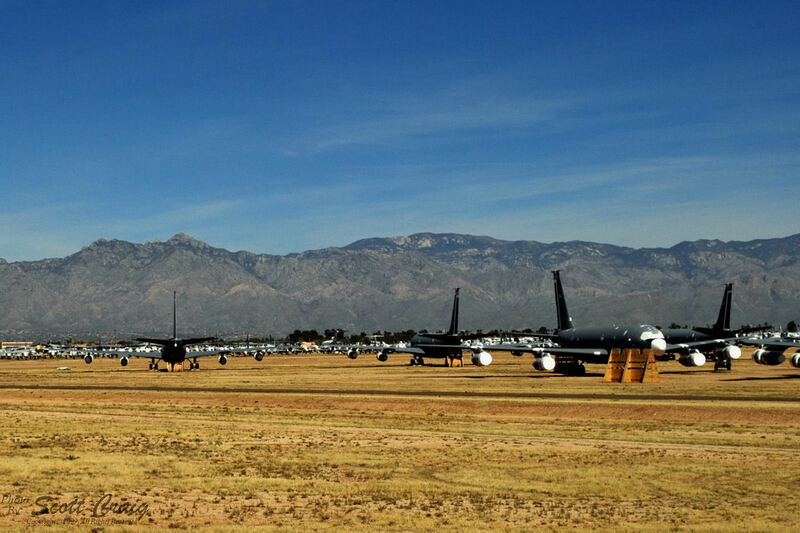 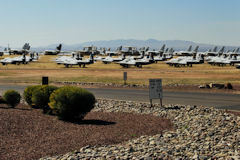 A year after this trip I got an email from a friend containing a link to a very well-written and highly-detailed web site containing many, many photographs from Davis-Monthan AFB entitled Monthan Memories. 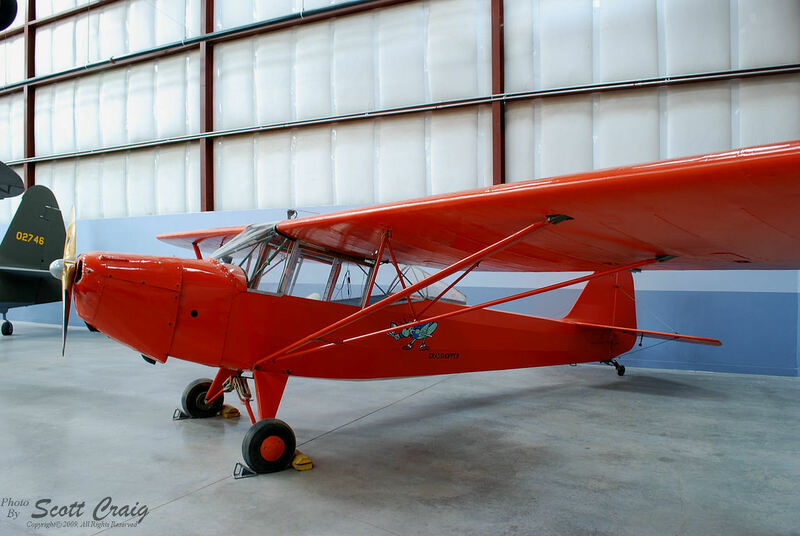 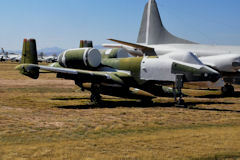 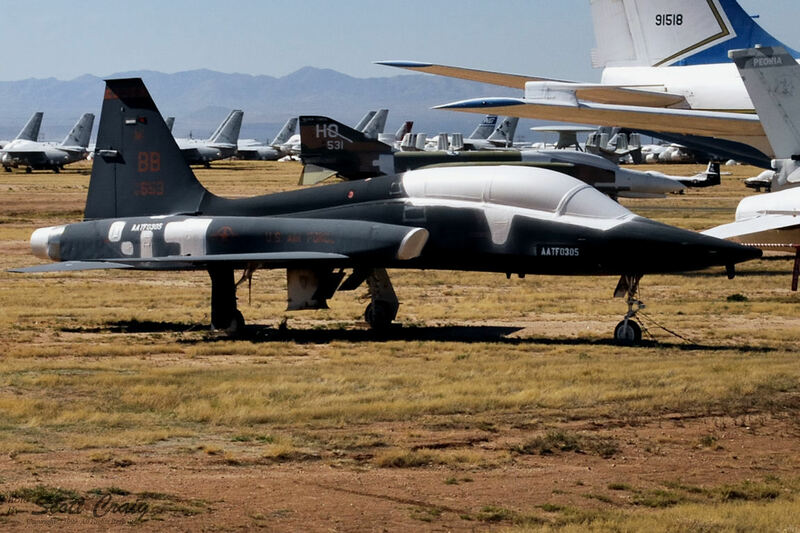 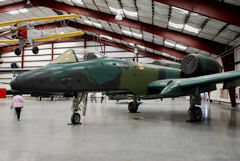 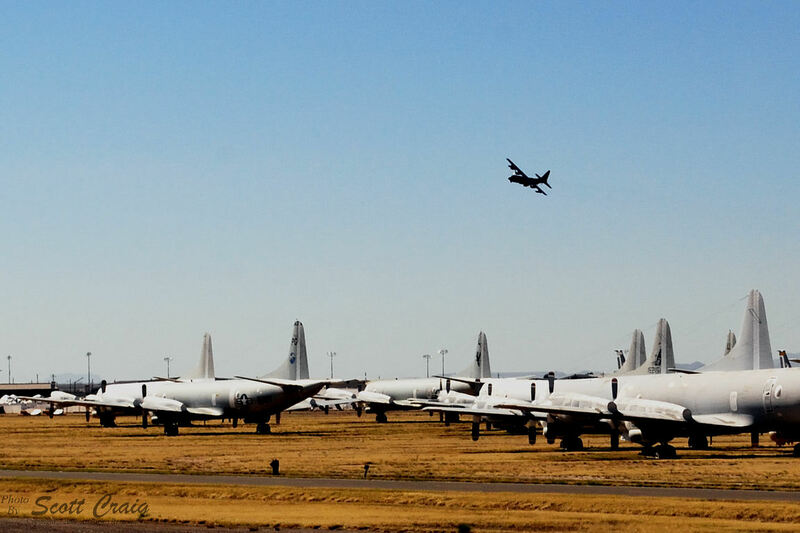 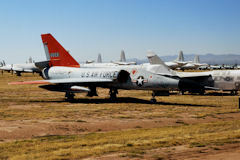 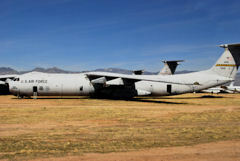 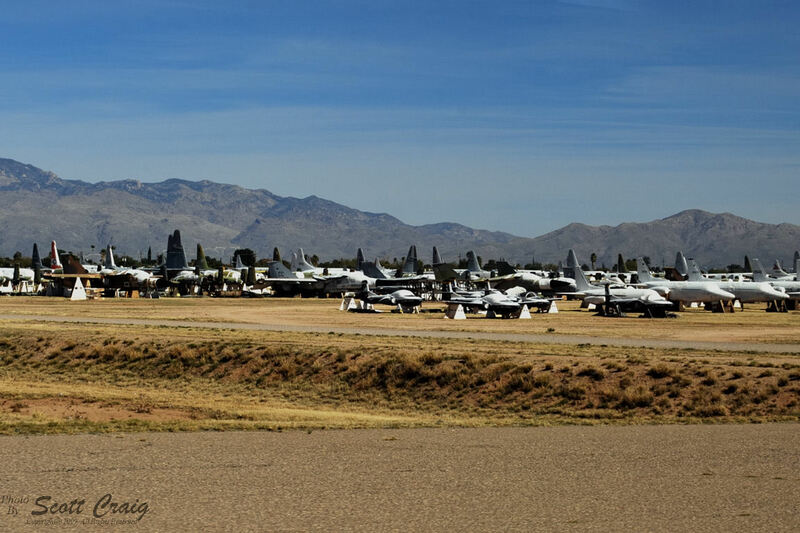 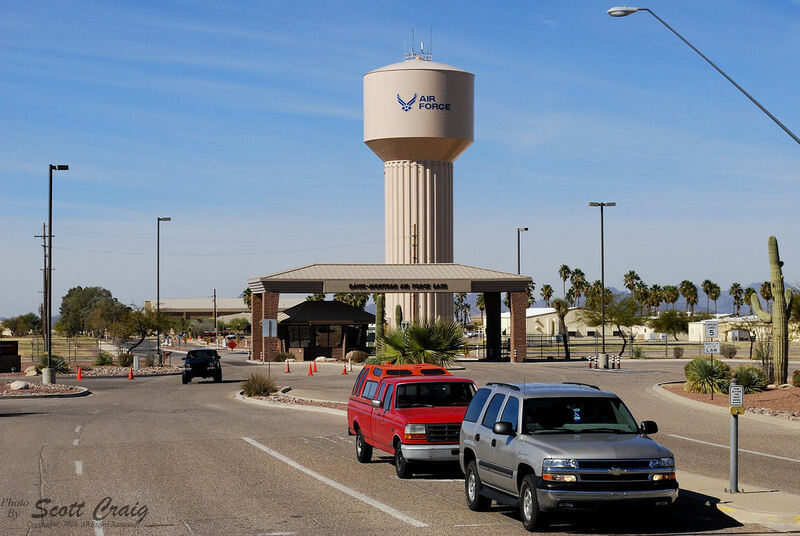 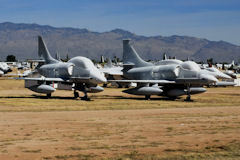 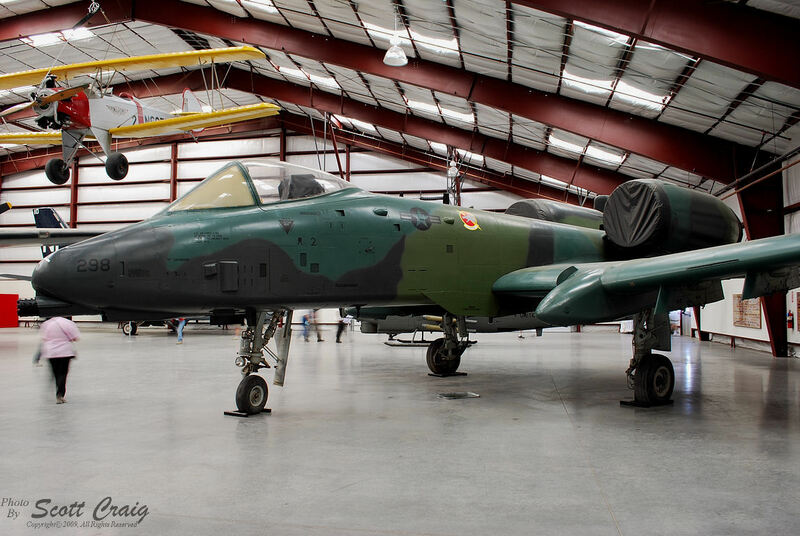 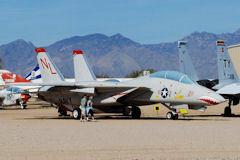 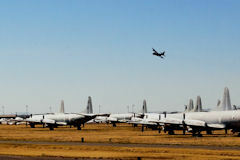 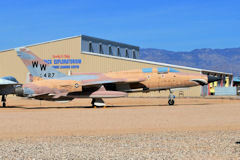 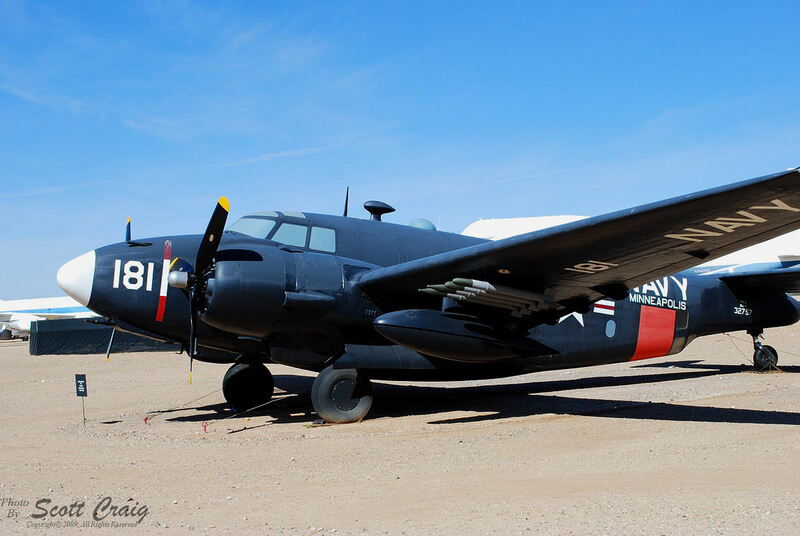 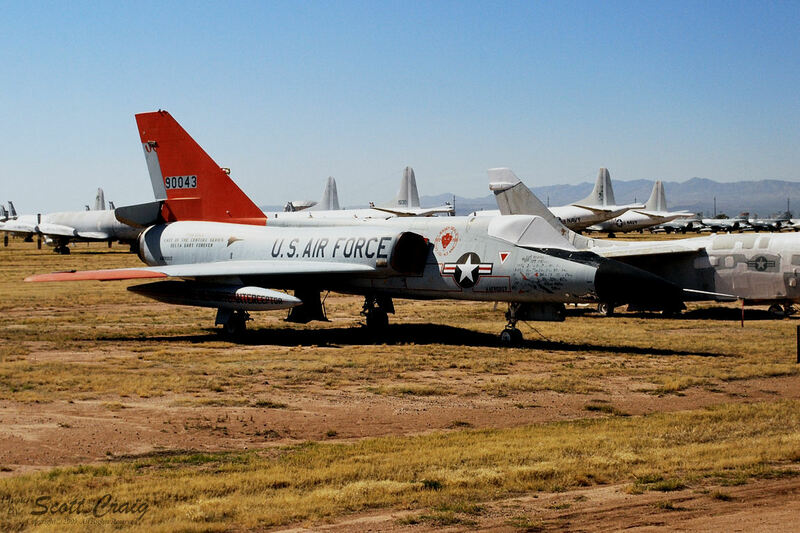 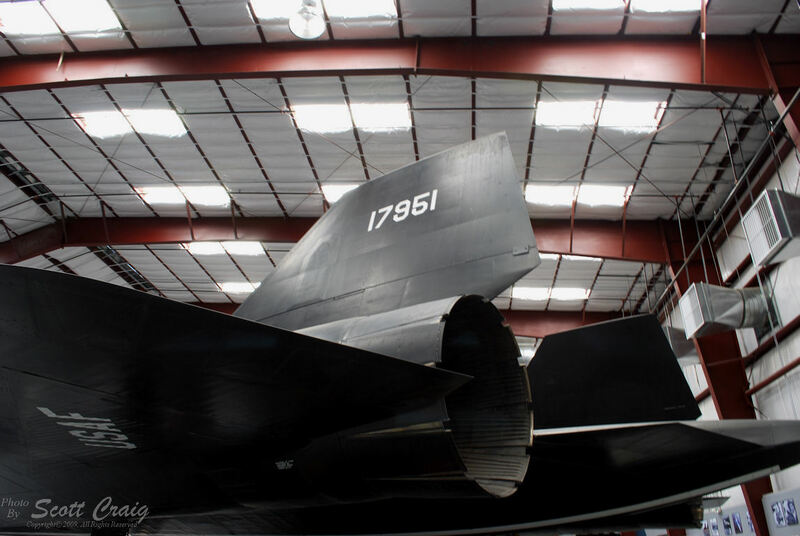 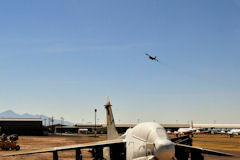 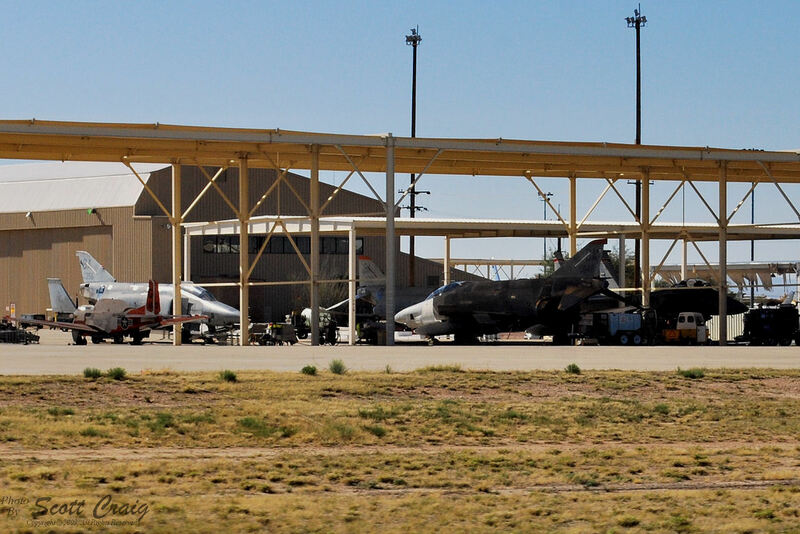 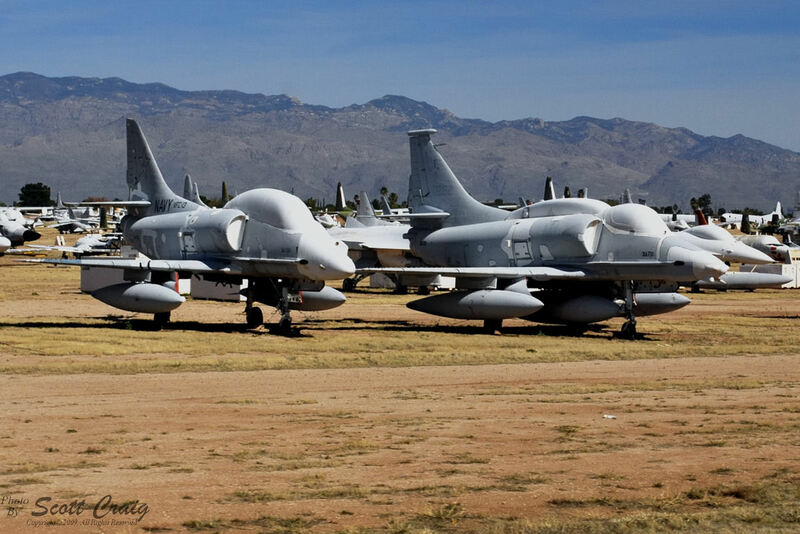 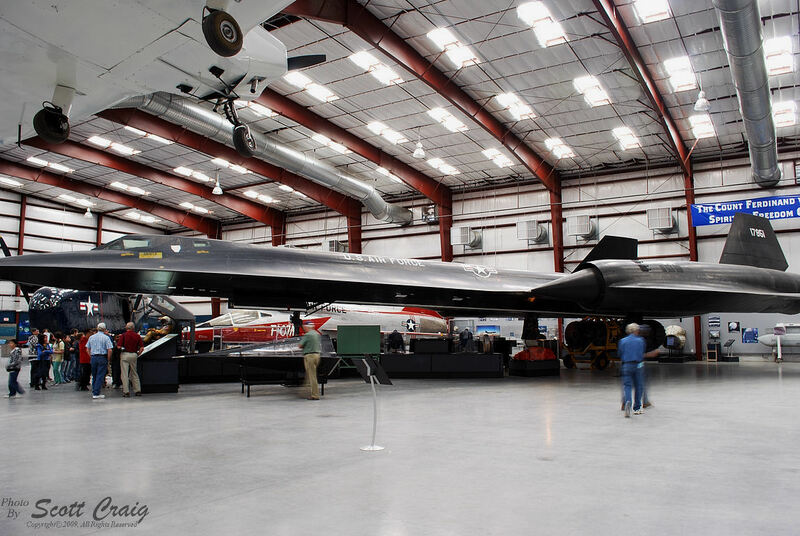 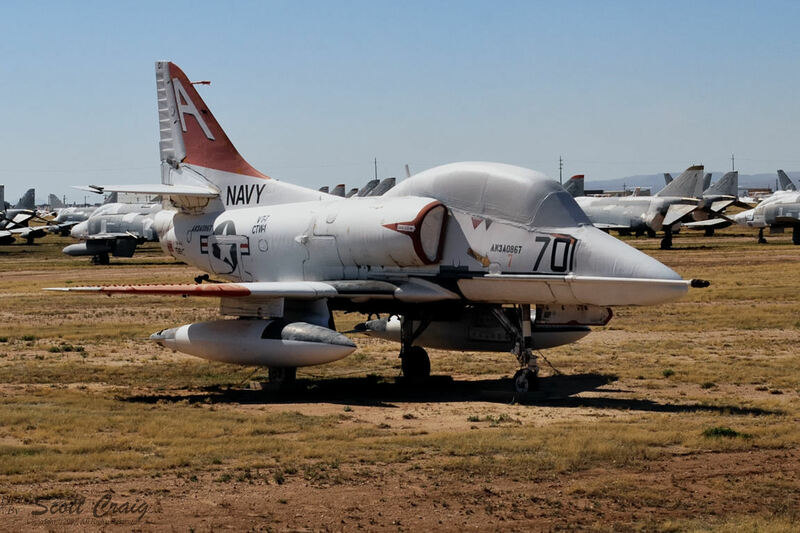 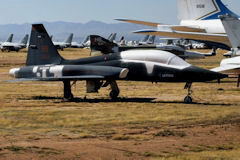 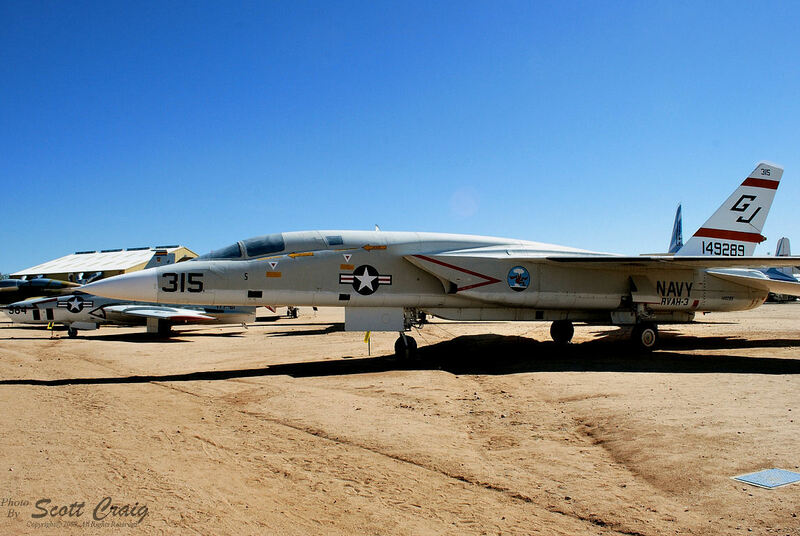 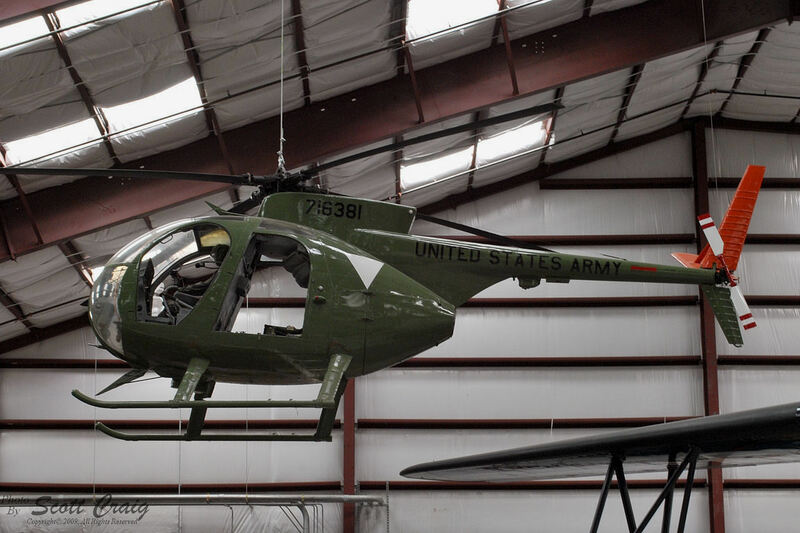 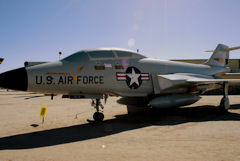 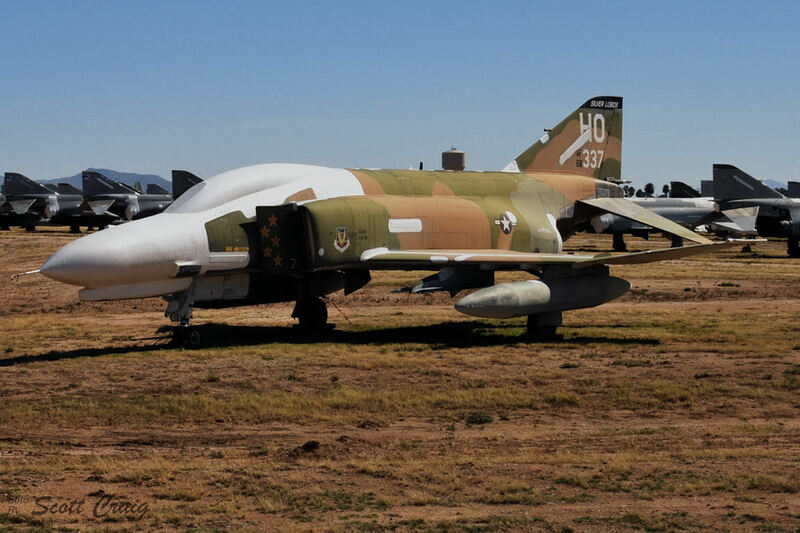 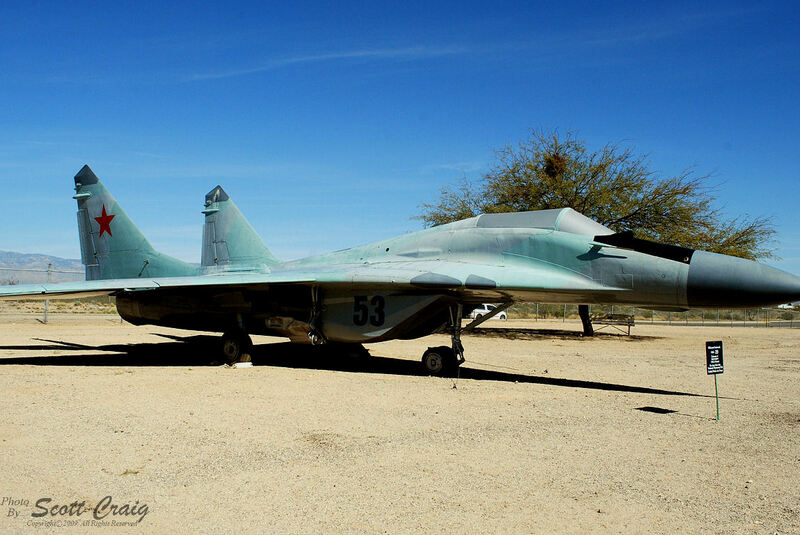 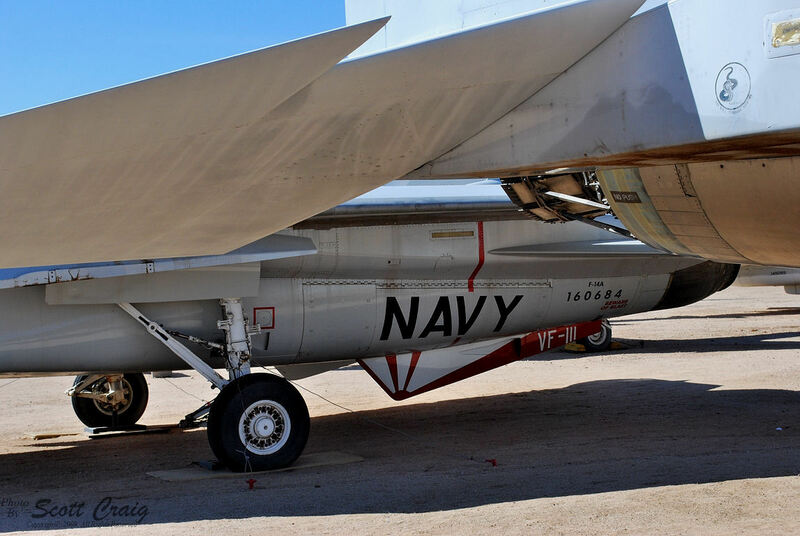 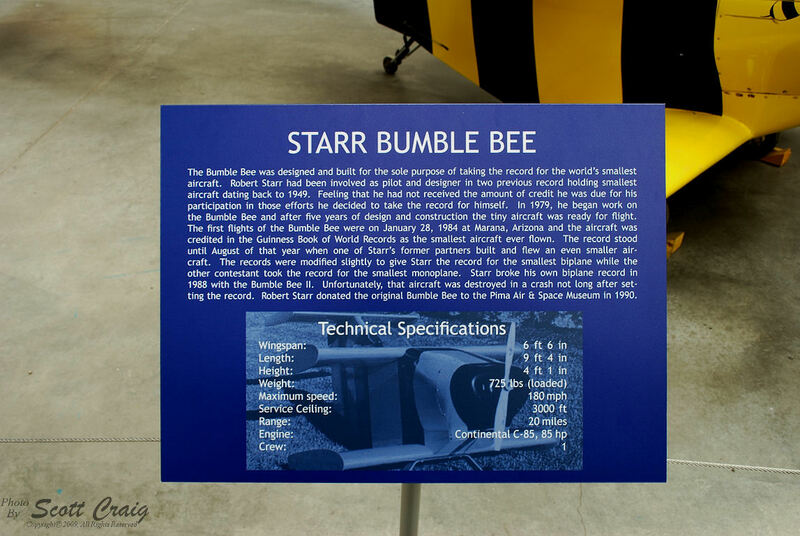 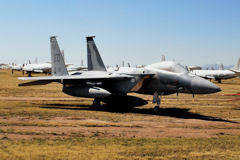 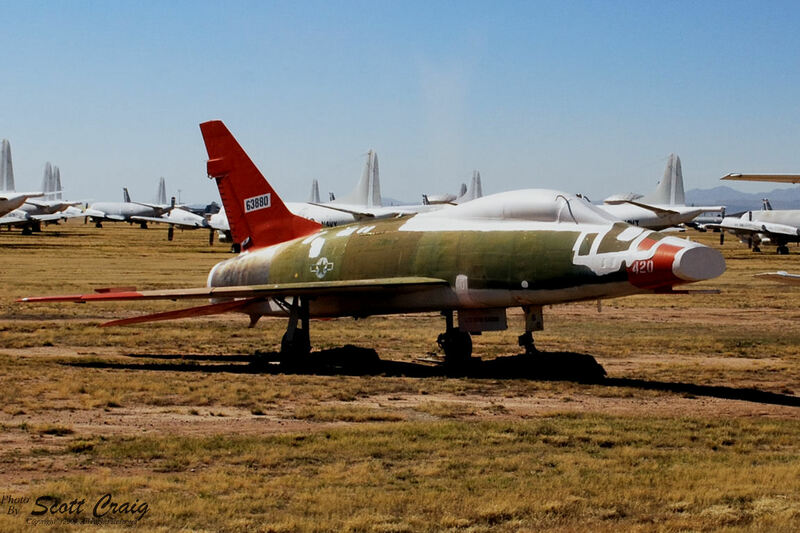 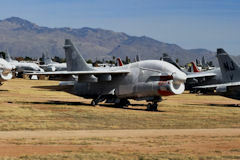 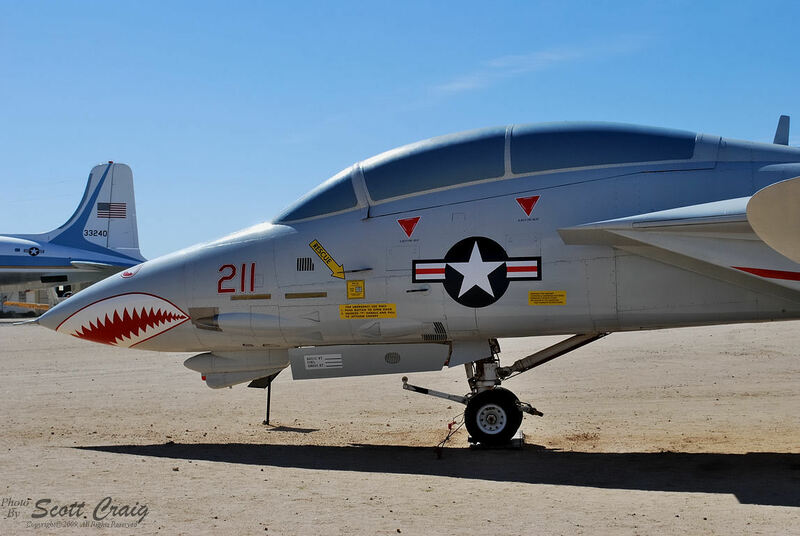 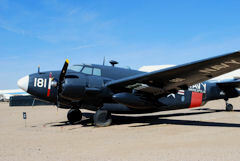 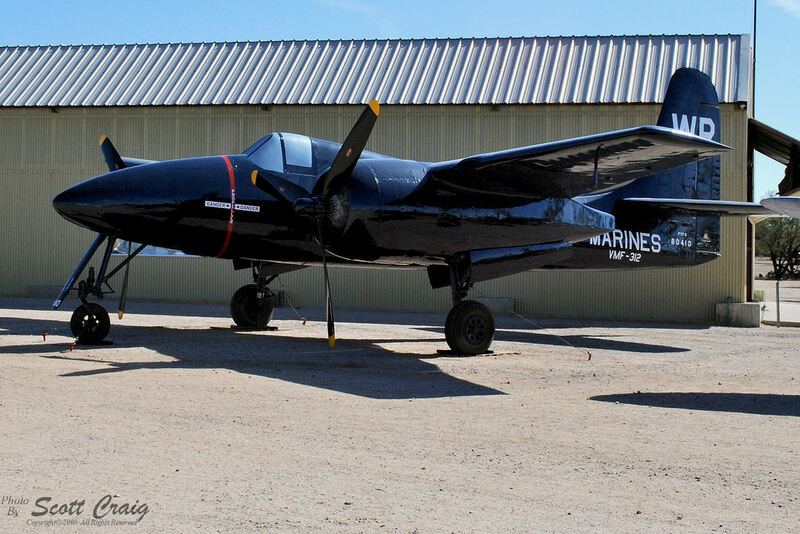 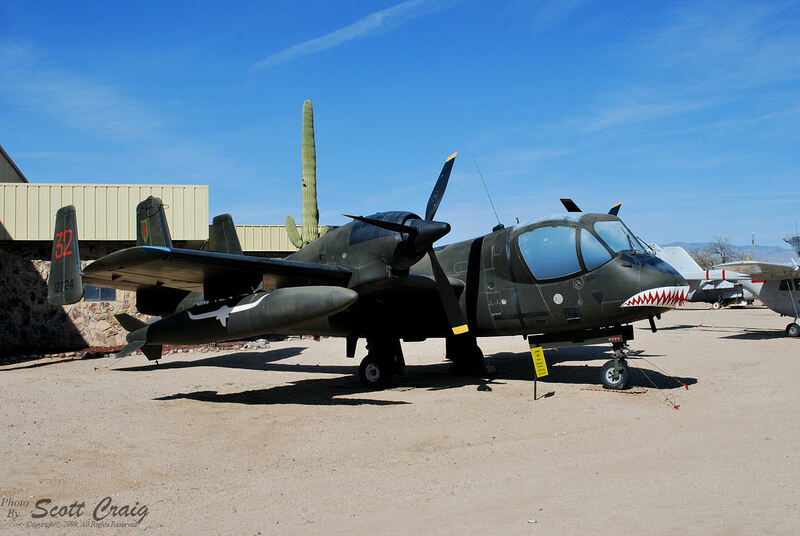 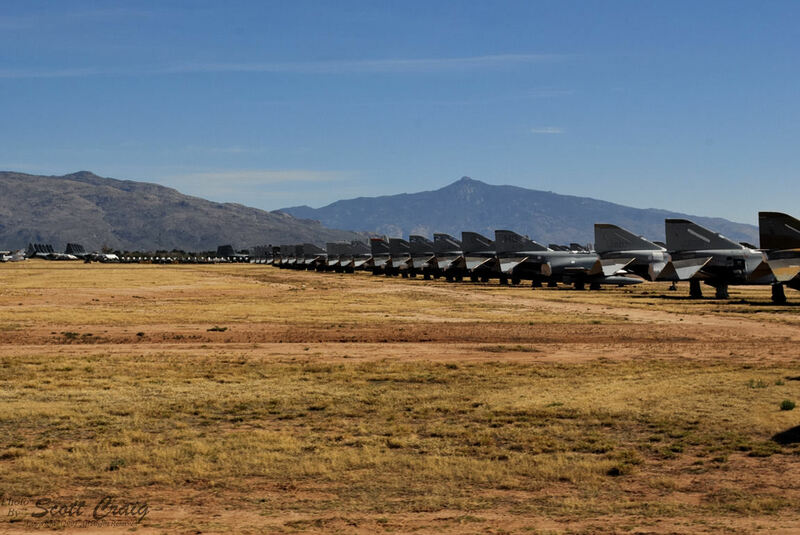 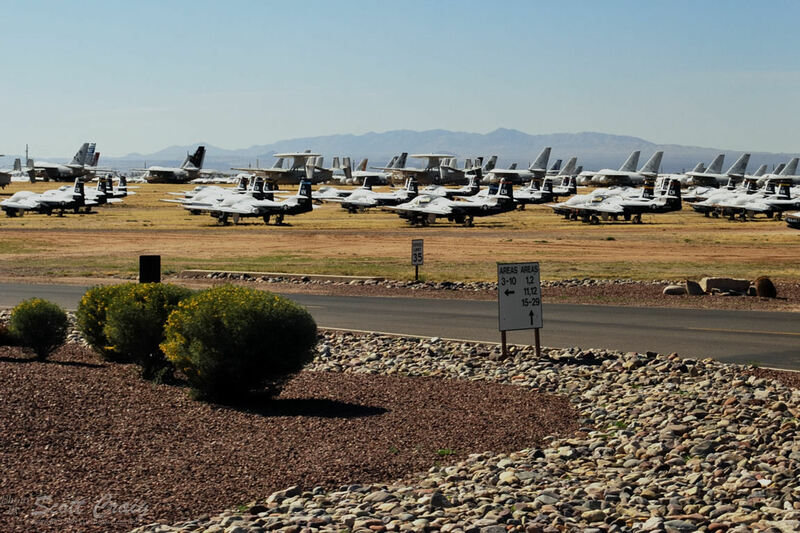 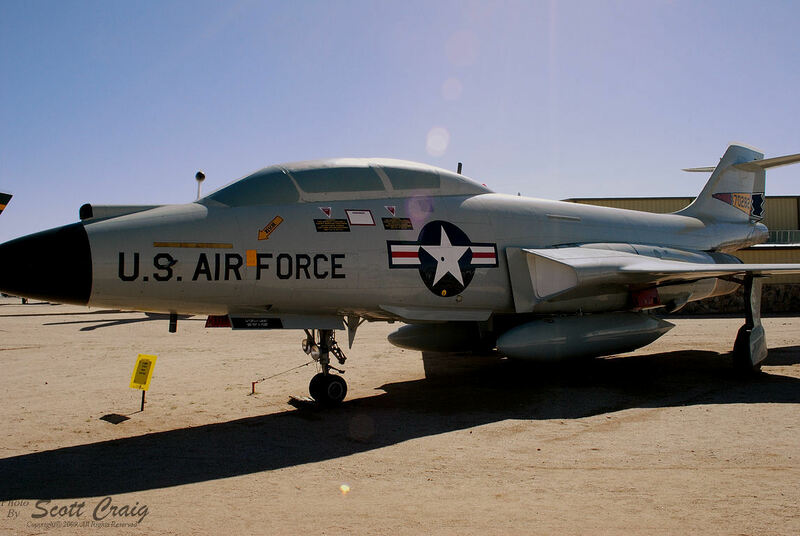 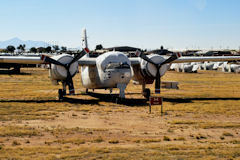 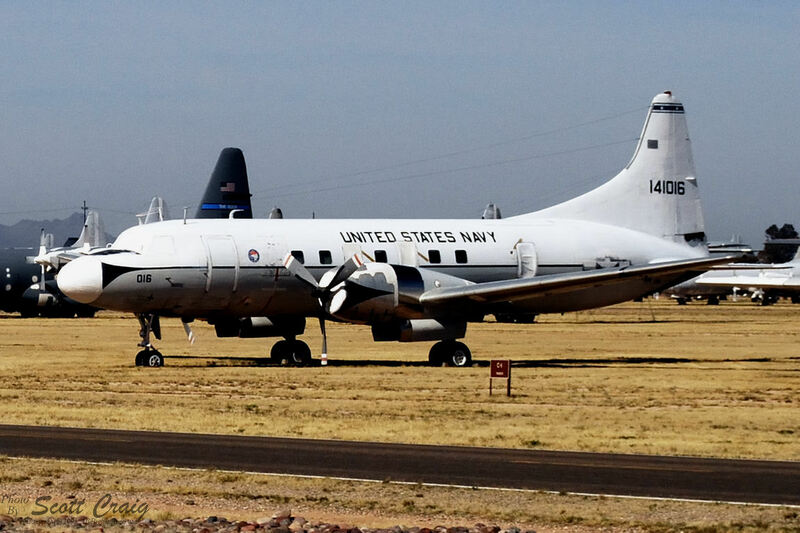 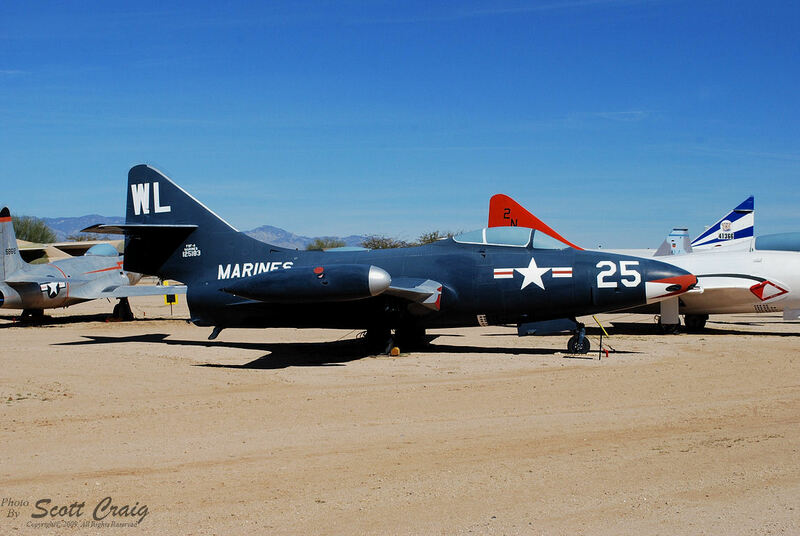 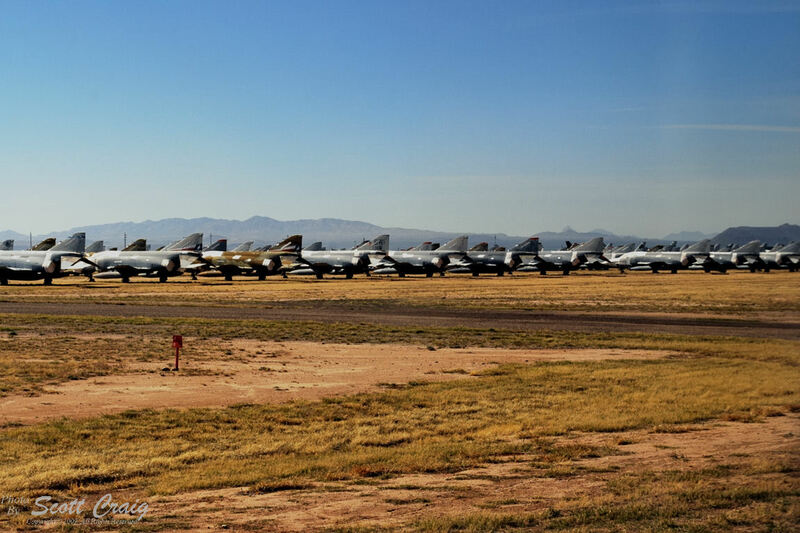 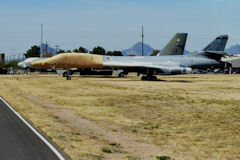 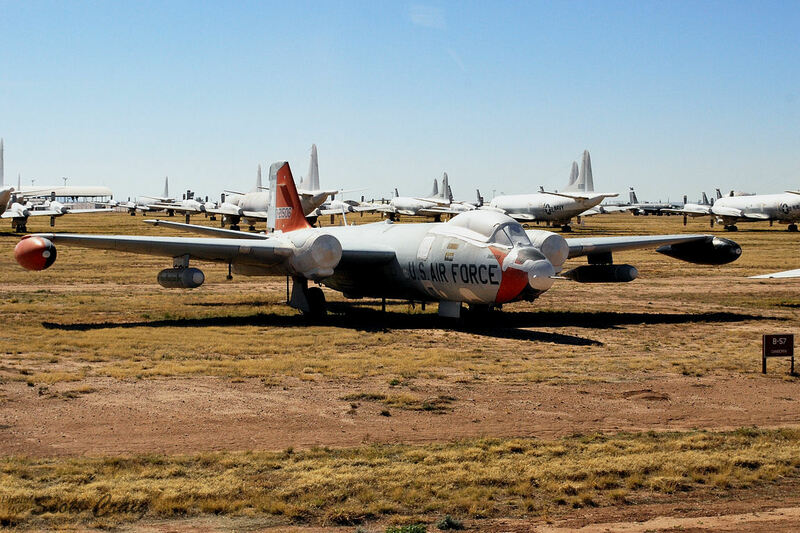 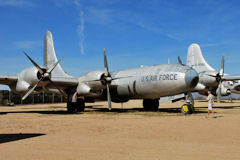 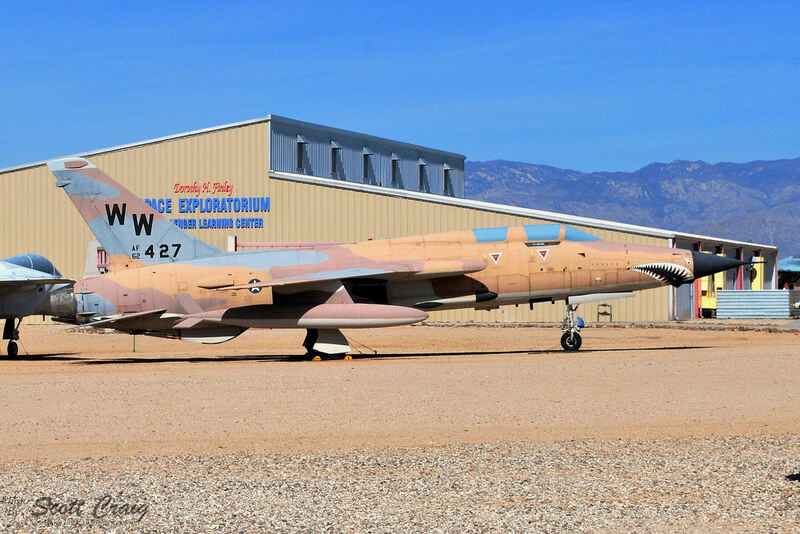 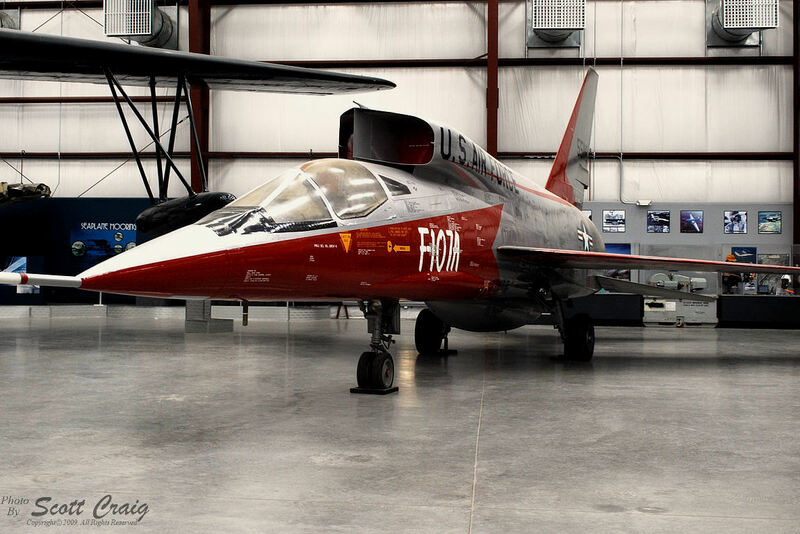 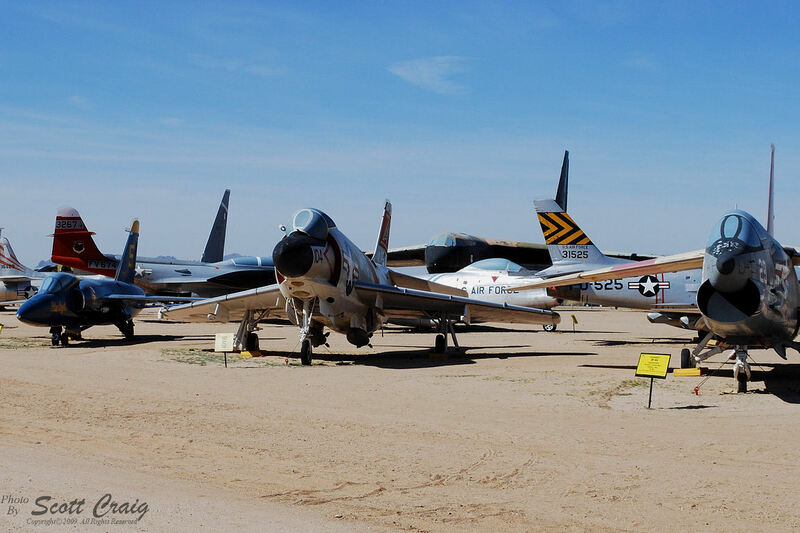 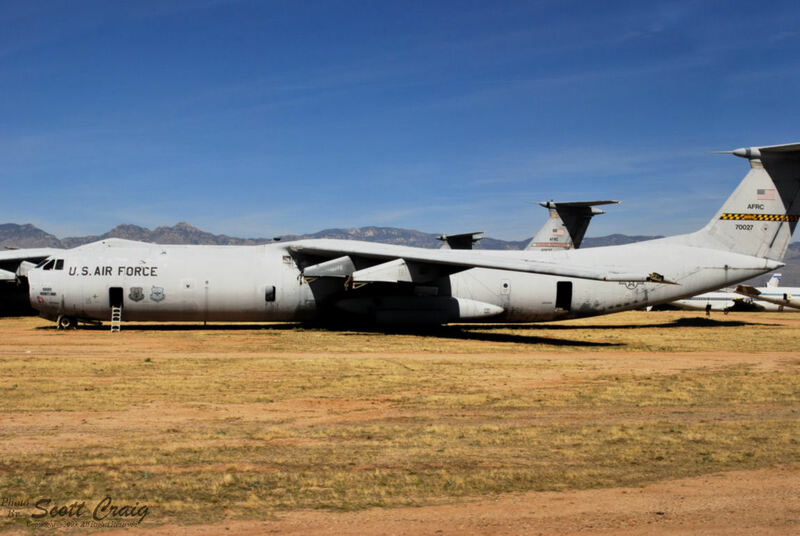 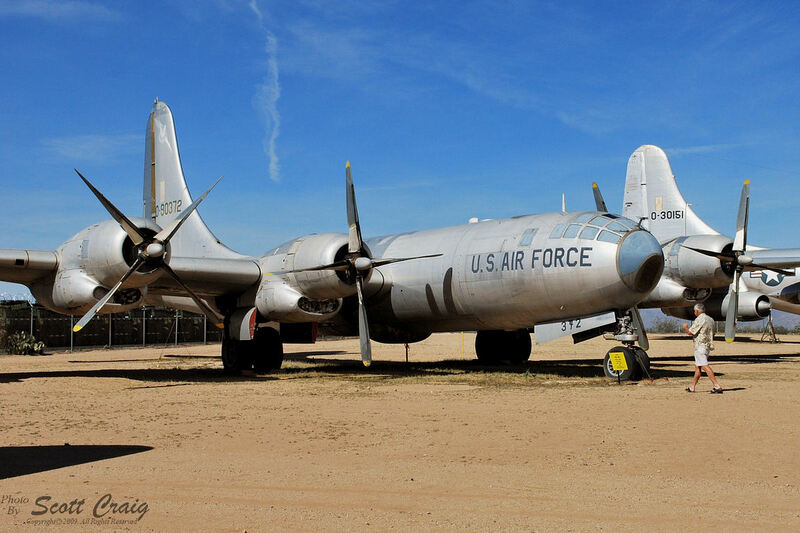 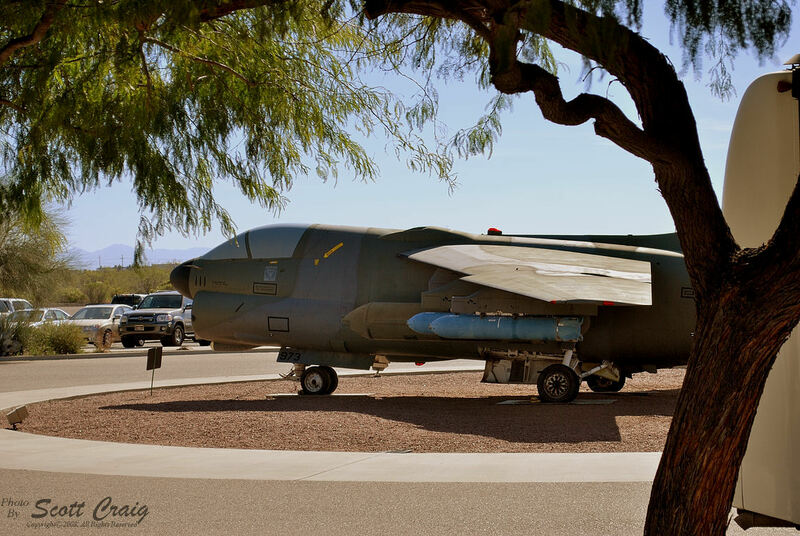 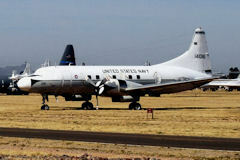 The site was written by Mr. Neil Aird and contains hundreds of black-and-white photographs, as well as a few color photos, taken back in the 60's of aircraft at Davis-Monthan. 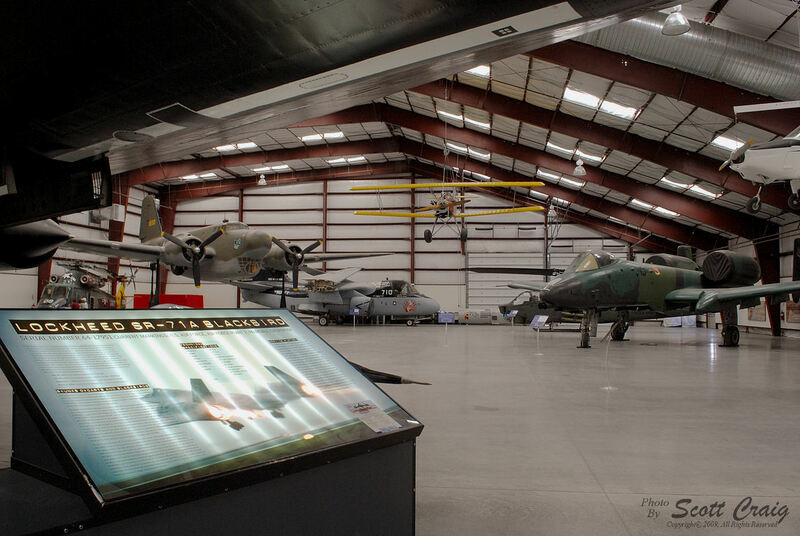 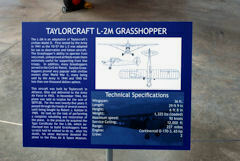 Mr. Aird not only shows photographs of individual aircraft but he shows the disposition of them as well. 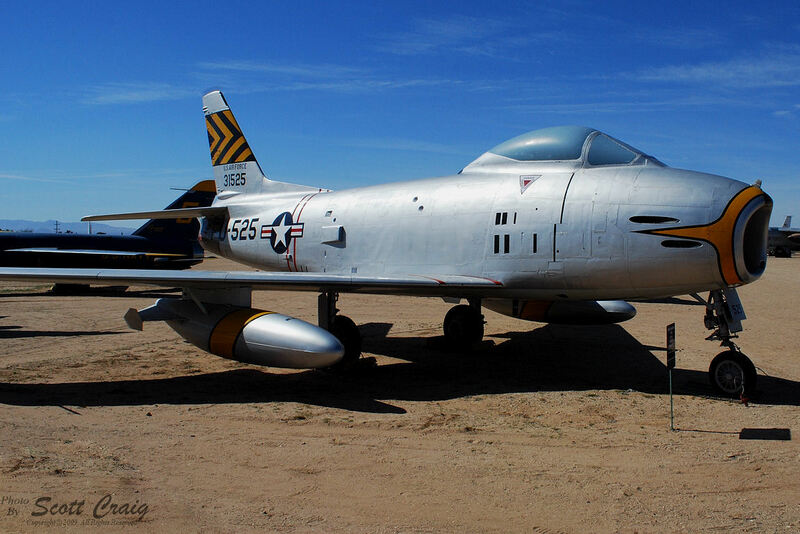 About 2/3 of the way down the page I happened to notice an F-86 with the caption "53-1525 North American F-86H-10-NA Sabre USAF. 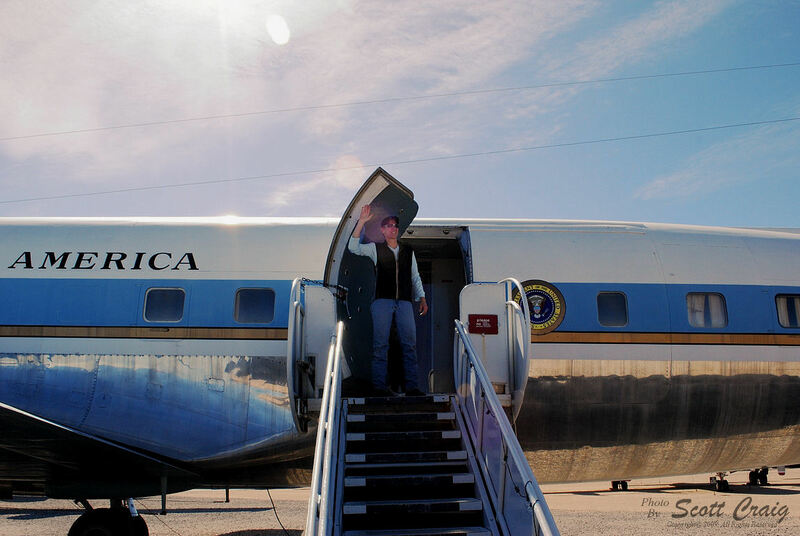 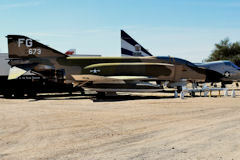 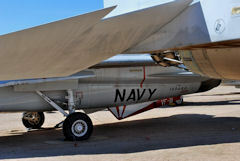 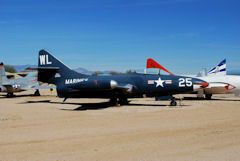 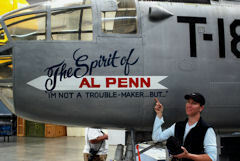 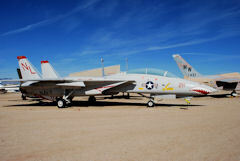 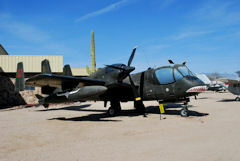 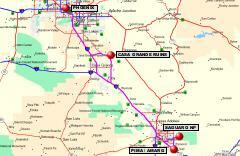 To Pima Air & Space Museum". I remembered seeing an F-86 while I was there and sure enough it carries tail number 53-1525. 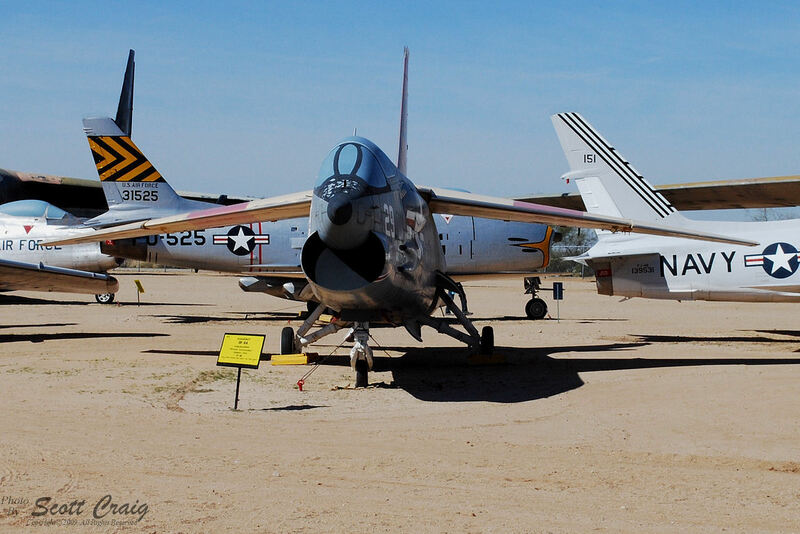 Over forty years have elapsed between the time he took his photograph in 1966 to the time I took a photograph of the same aircraft in 2009. 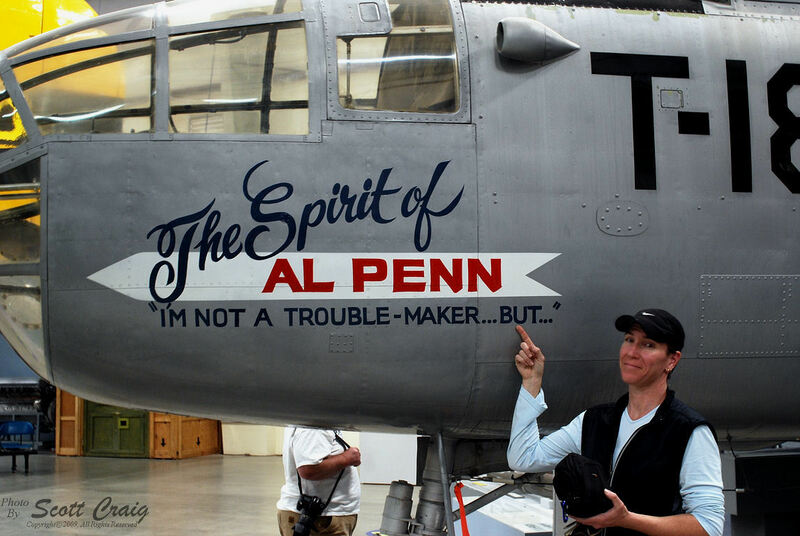 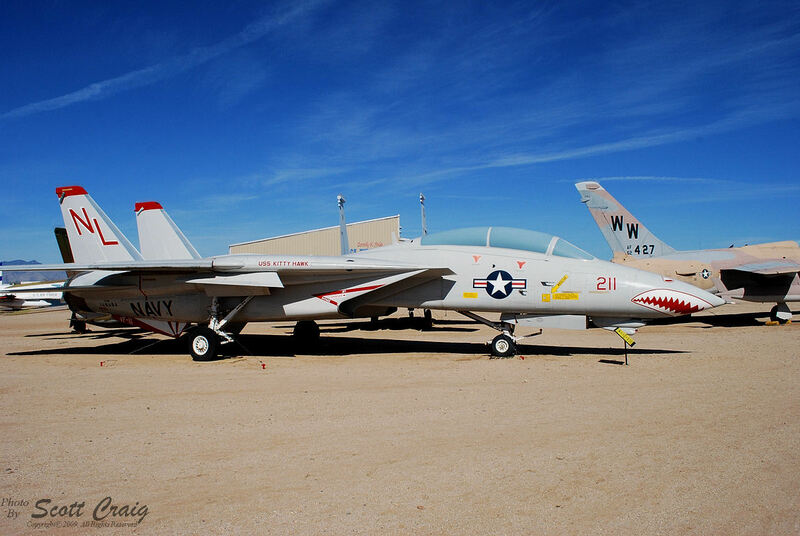 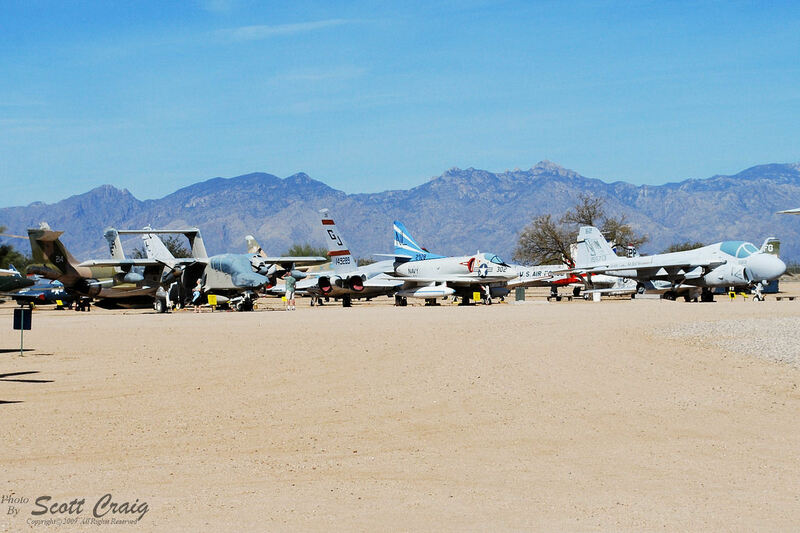 You can see the "Before" photograph on his web site at this link: Monthan Memories (I won't post the photograph here since I have not obtained his permission to do so, just search for the tail number 53-1525 and you'll find it) and mine is the third photograph in the fifth row above. 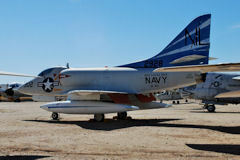 If you scroll further through his web page there are a few other correlations with aircraft then and now as well. 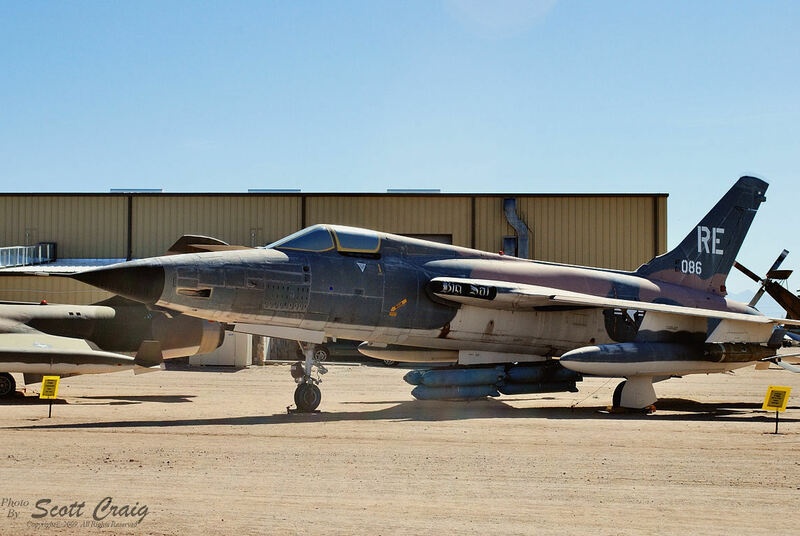 I sent Mr.Aird an email along with a copy of my photograph and mentioned how strange it felt to see two photographs take of the same airframe but 40+ years apart. 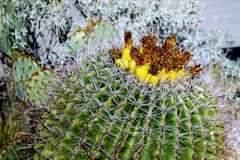 I got an email response from him effectively saying that he knew how I felt because he had already run across the photograph here when he happened across my web site. 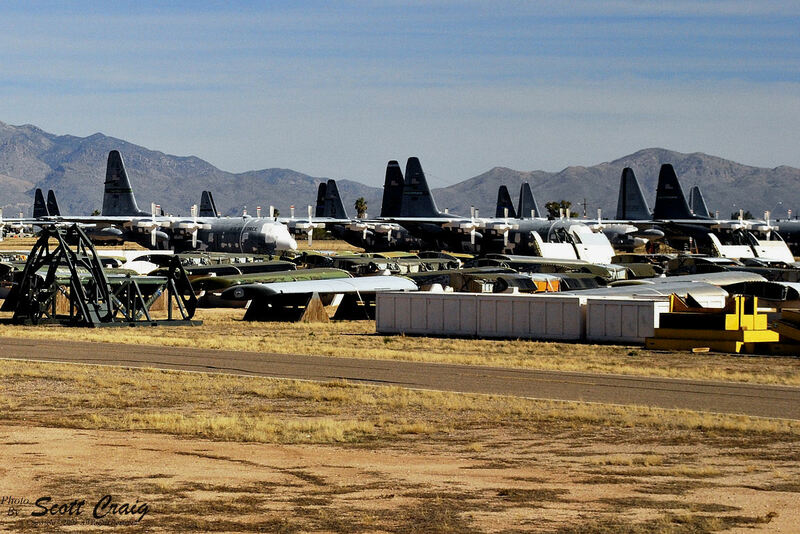 Like I said, it's become a very small world! 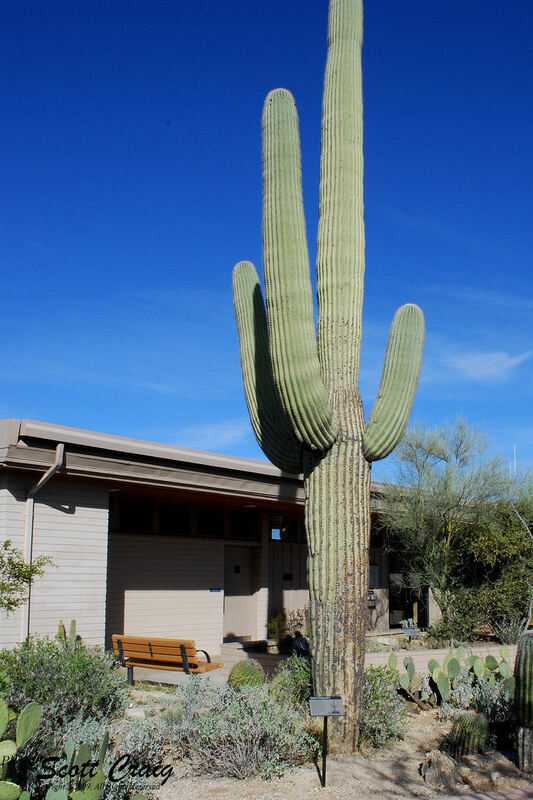 The museum has vending machines scattered around outside, so we grabbed something cold to drink and chatted for a few minutes. 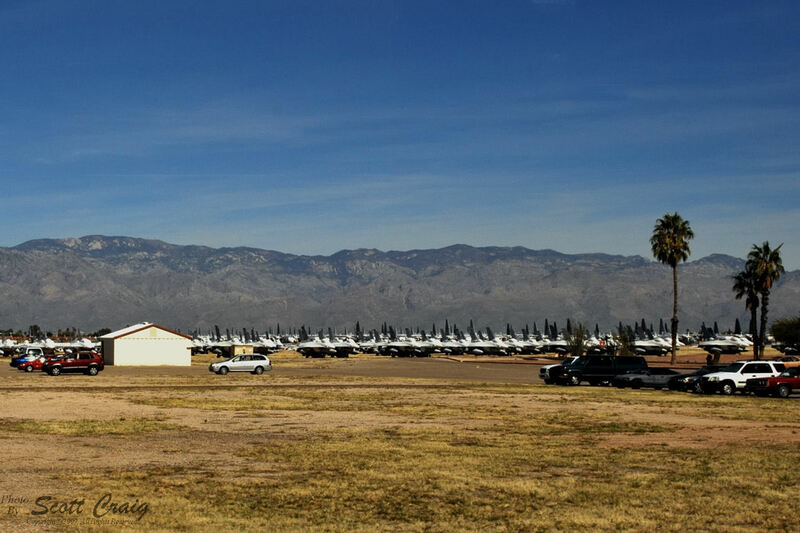 The temperature was in the mid 80's and I tried to imagine what it would be like in the middle of summer when the temperature exceeds 110° and the sun is reflecting of the hard-packed sand. 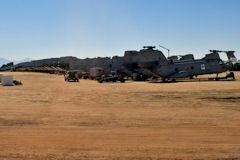 Even with all of AGirl's comments about how miserable it can be I don't think I could even begin to fathom that kind of heat. 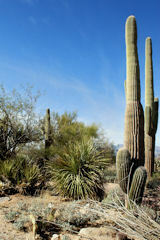 Tennessee is bad enough with our high humidity, but I think I'll leave the desert heat to those that live there. 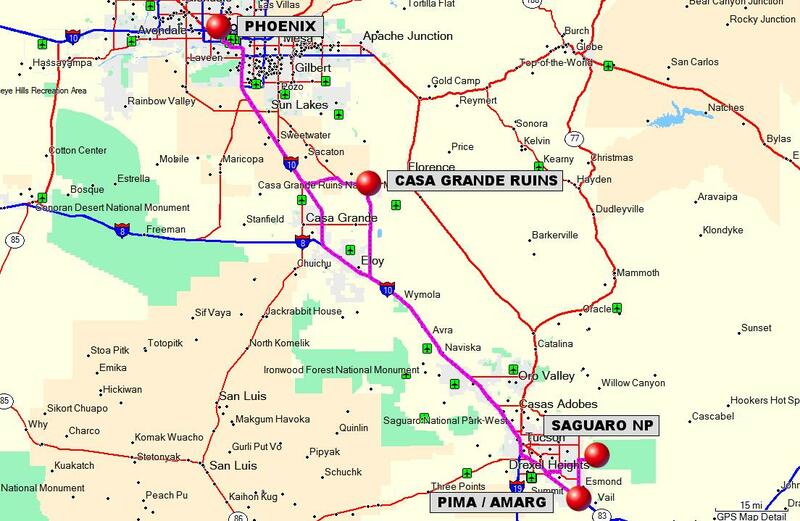 One more stop today and then it's a blast back up I-10 to Phoenix. 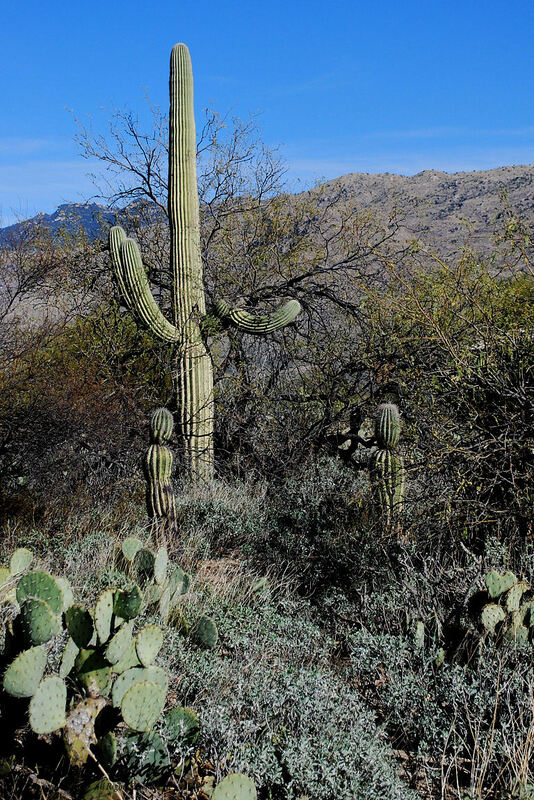 A 15 mile jaunt northeast brought us to the Saguaro National Park (it's pronounced "Su-wa-ro", and yes I know the letters don't match the pronunciation) east of Tucson for yet another National Park Passport Stamp. 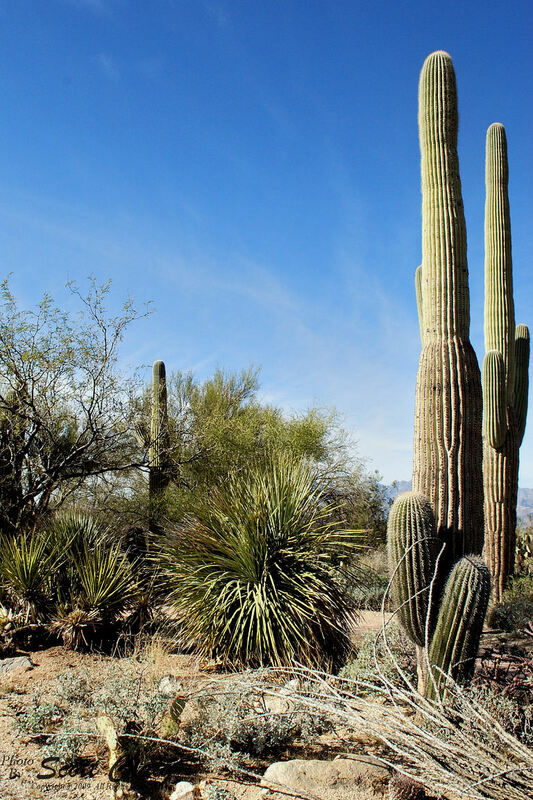 Saguaro National Park is a preserve for the Giant Saguaro Cactus that has become a symbol of the Old West, and much of the "Modern" west. 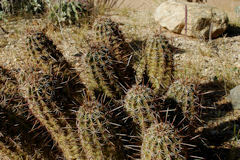 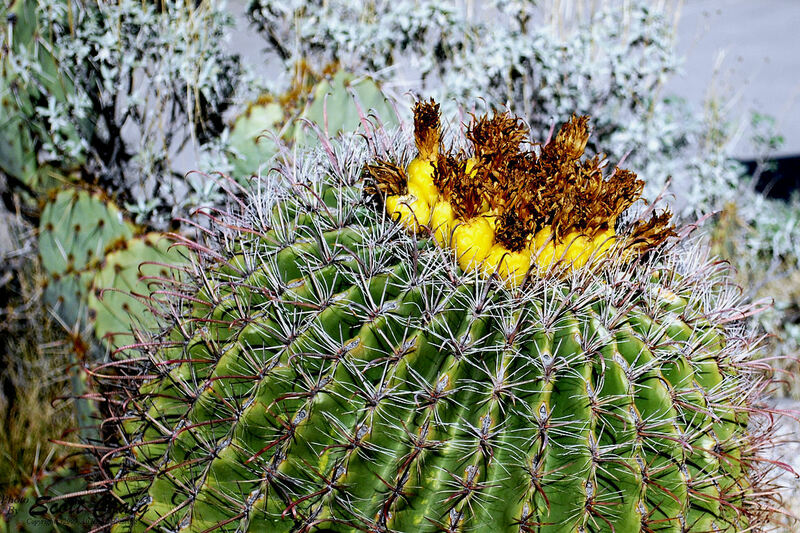 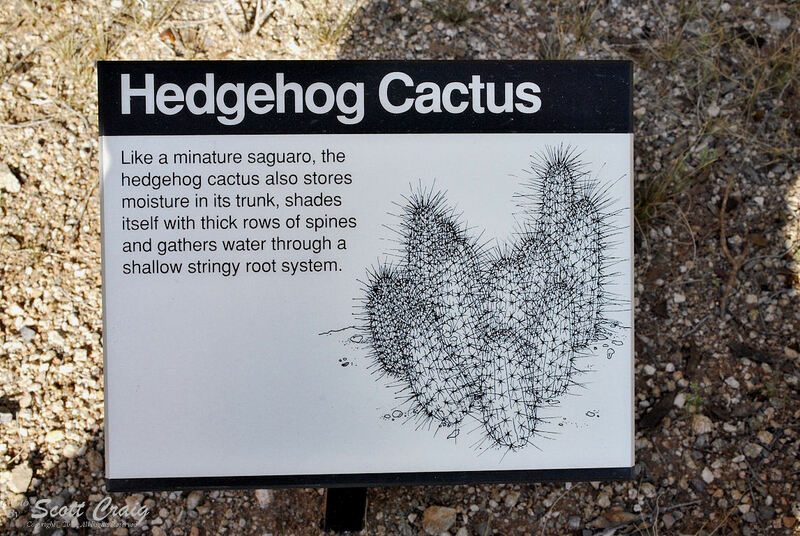 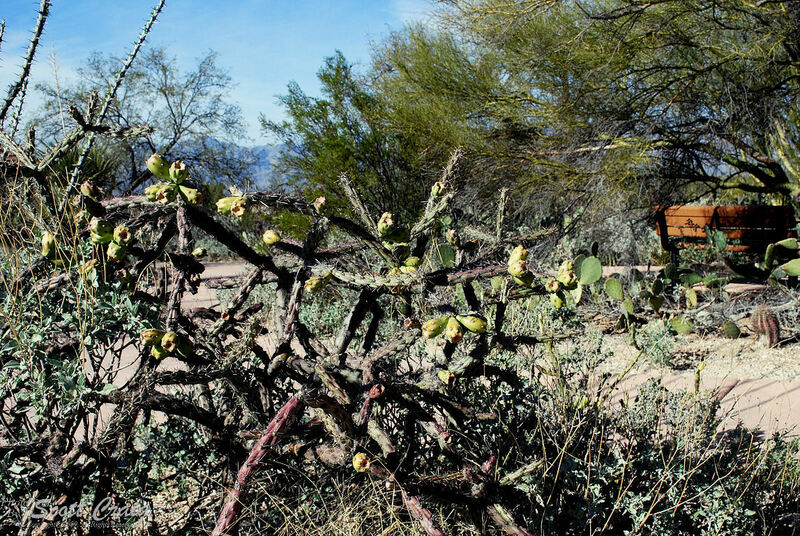 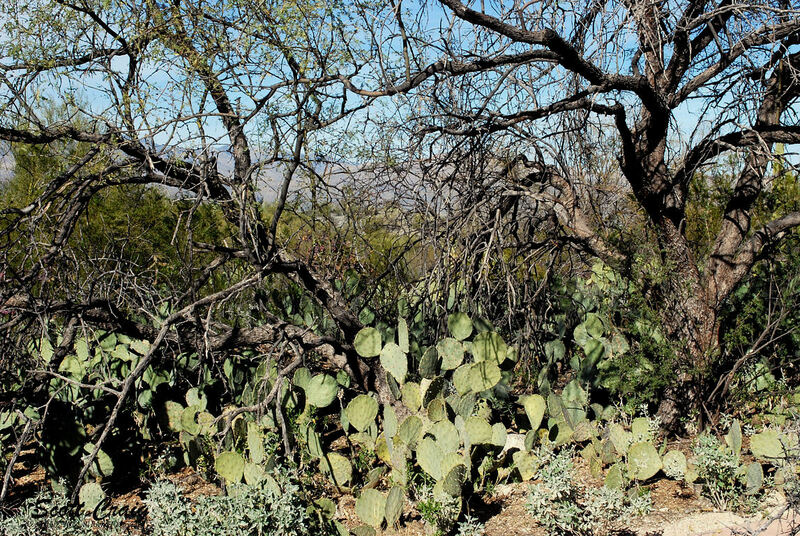 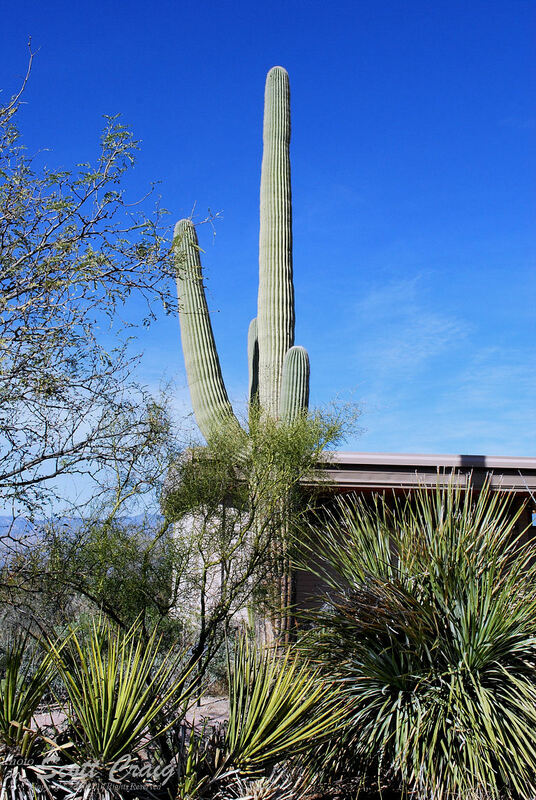 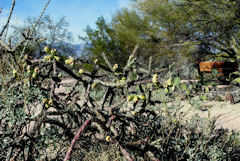 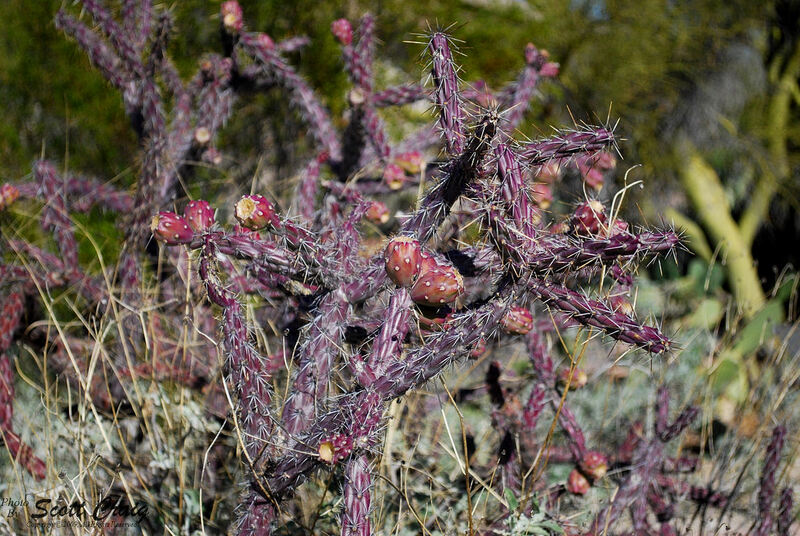 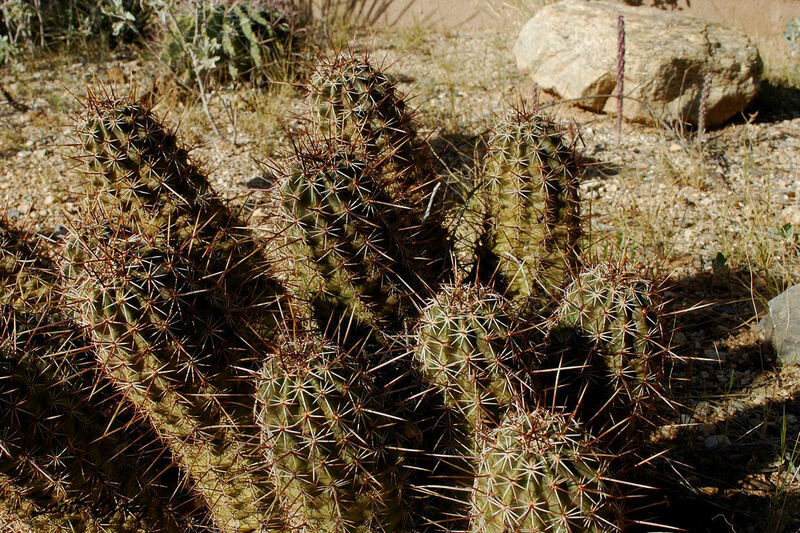 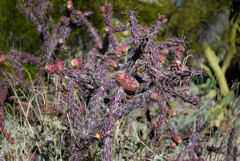 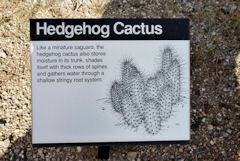 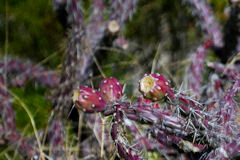 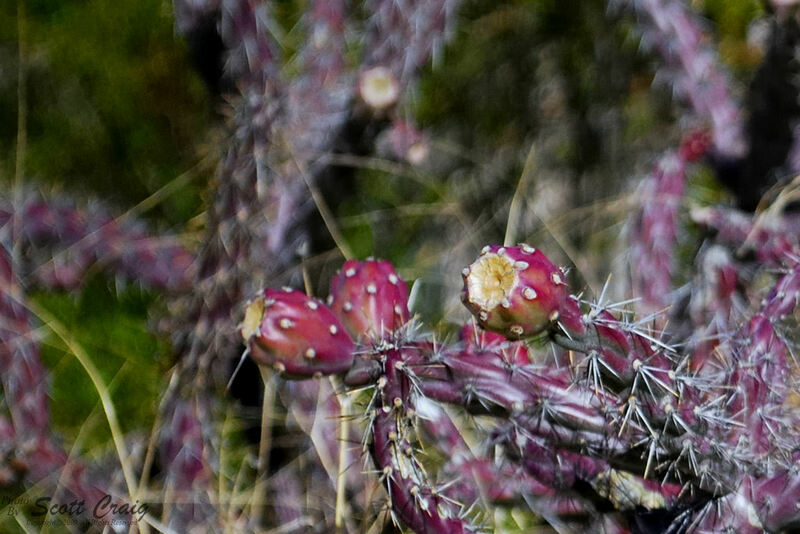 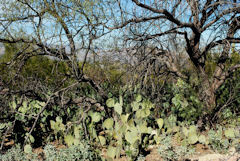 These cactii are only found in a small area of the world and this preserve contains a large percentage of them. 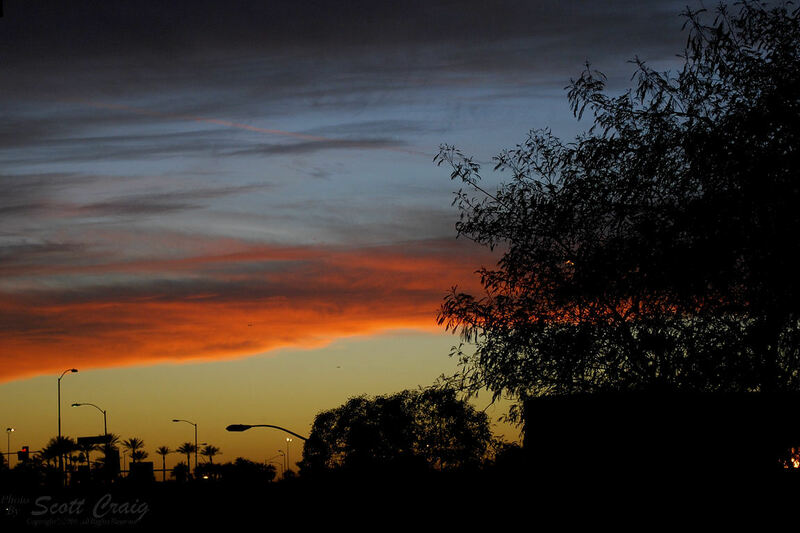 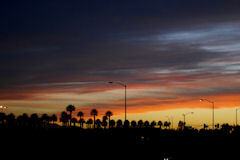 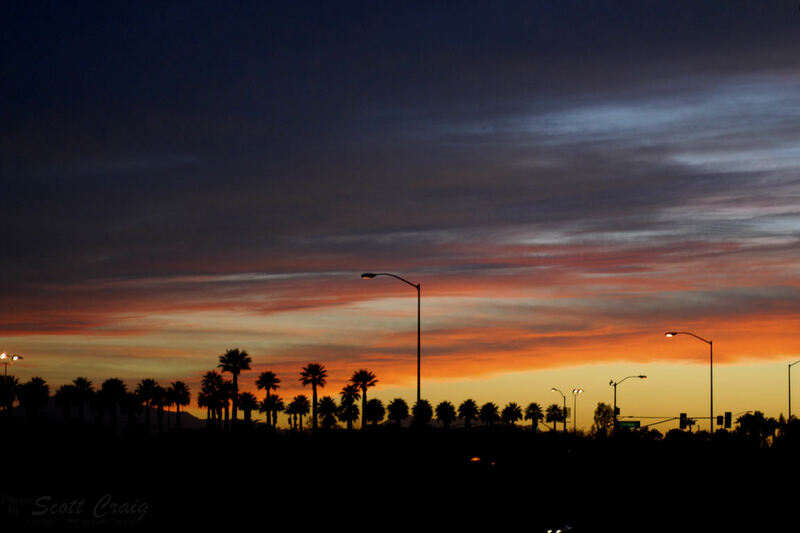 We headed back up I-10 to Phoenix and were treated to an absolutely glorious sunset all the way back. 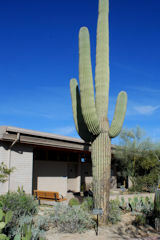 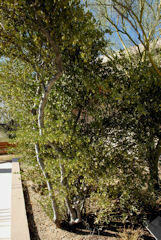 We stopped at a park in Phoenix to take a few photographs of it. 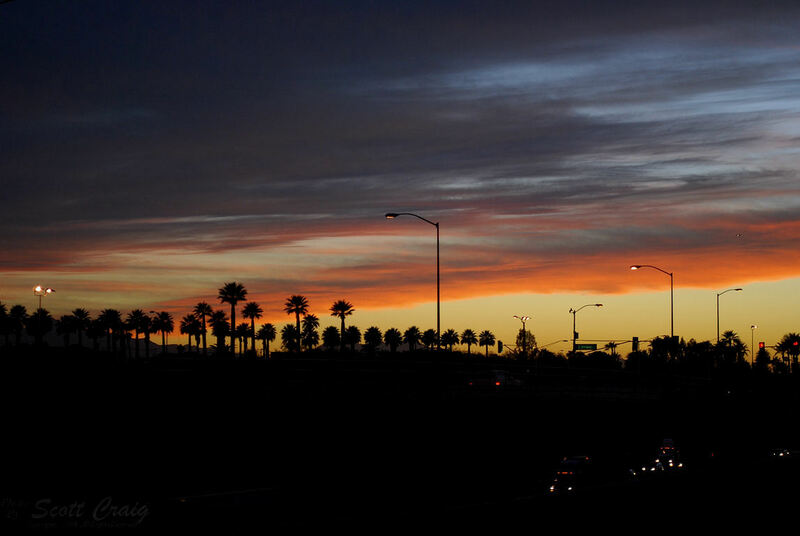 This was the most vivid sunset I've seen since I've been out here. Perhaps it was coincidental that it happened at the conclusion of my trip, perhaps not.